Your plans ROCK! 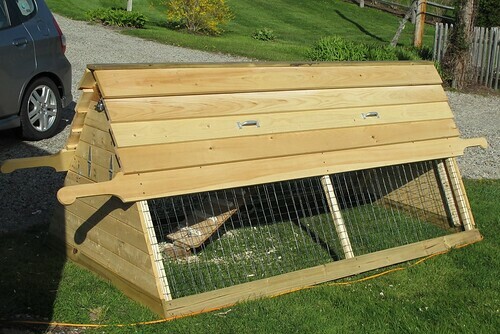 I recently bought some barn shed plans. Oh if ONLY they had been like yours! 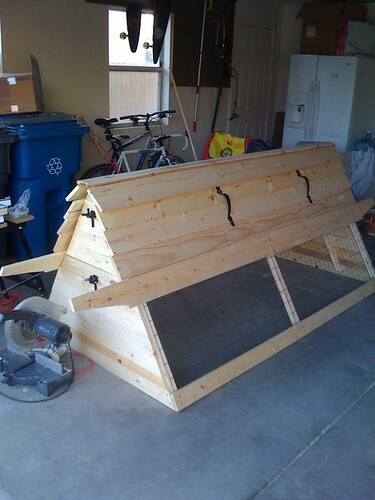 I ended up building the shed from trial and error because the plans were USELESS! 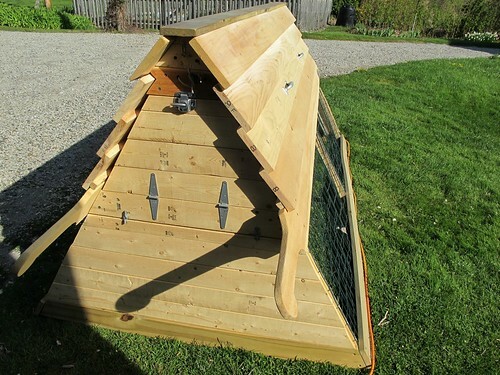 With your plans, I spent two lazy summer days with the smell of pine shavings in my nose and the sun on my shoulders and ended up with a very cool chicken ark!! Thanks so much for a quality product- my money was well spent! Hi! 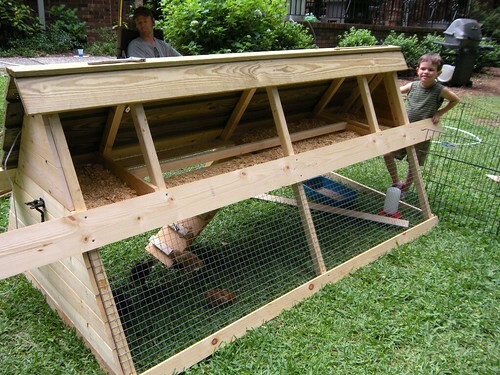 We got the coop done and added an extension run. 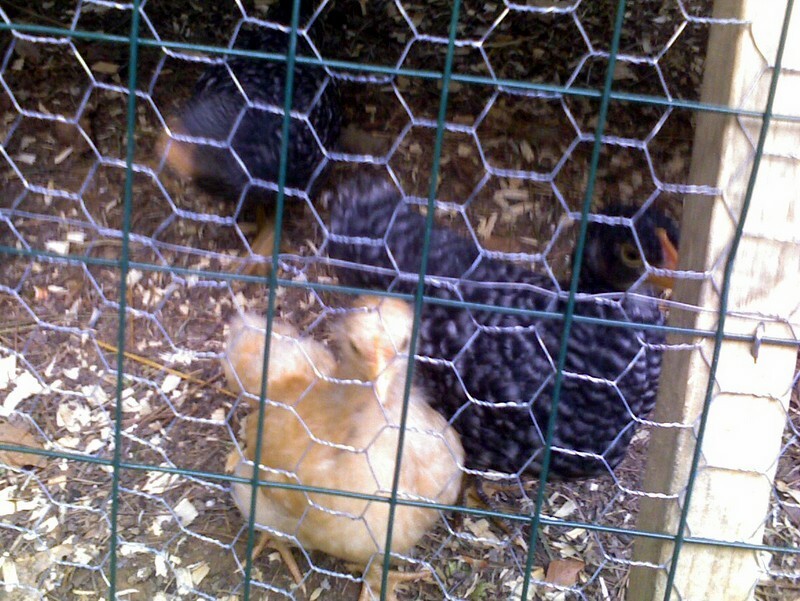 We've got three hens in there now and might add another. 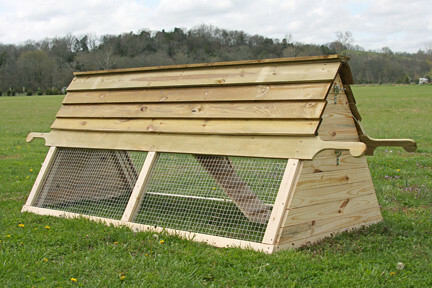 I also did a few posts on my blog about it chriskafer.wordpress.com Cant wait for fresh eggs!. 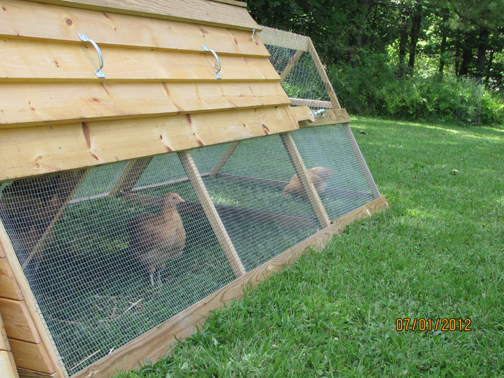 I used your frame idea to make an open half coop that is a bit smaller (height and width) than the original. You'll see in the picture how it just slides onto an end. 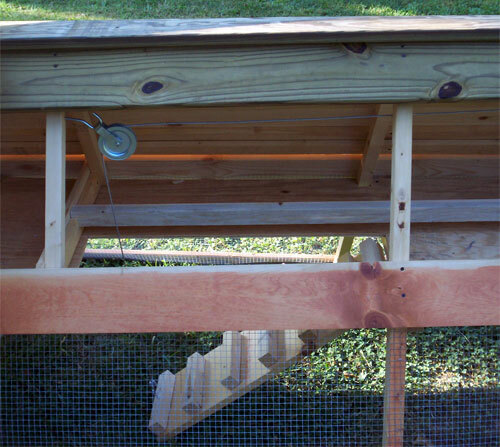 I had to attach a 2x2 on the side of the extension to fill the gap where the bottom door goes. 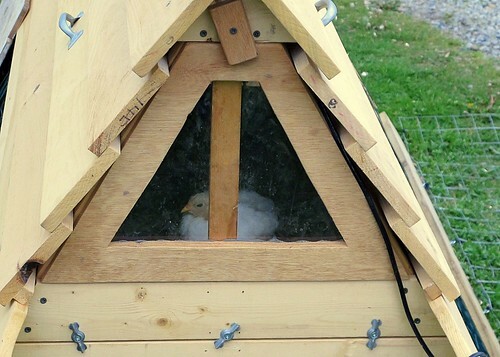 The extension has an extra roost as you'll see. 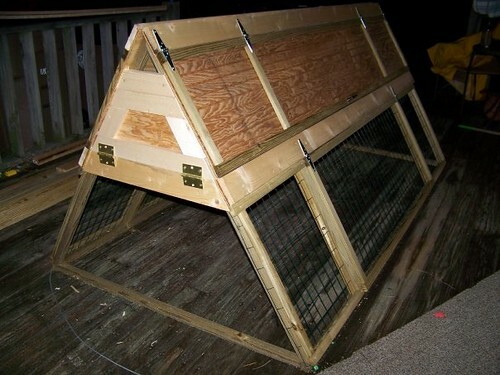 I used hardware cloth on the coop since there are a number of animals in the area including coyotes. 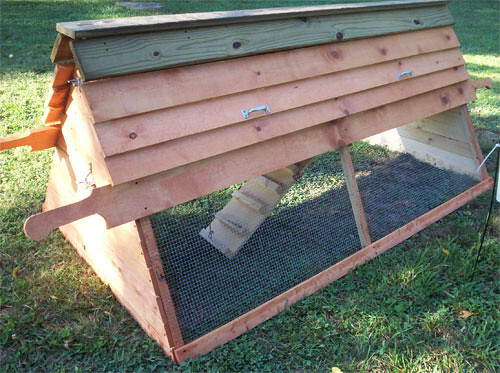 I used chicken wire on the top half of the extension because it is what I had around. 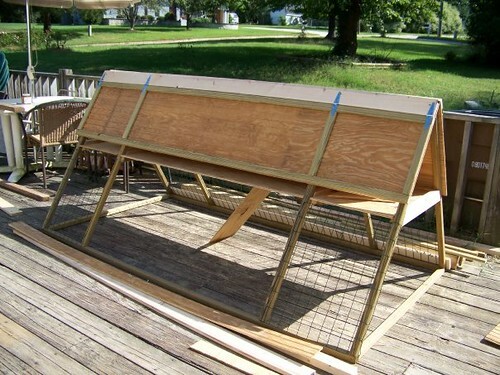 The extension does make moving the coop a three step process since one has to move the extension out of the way first, then move the coop, and then put the extension back. 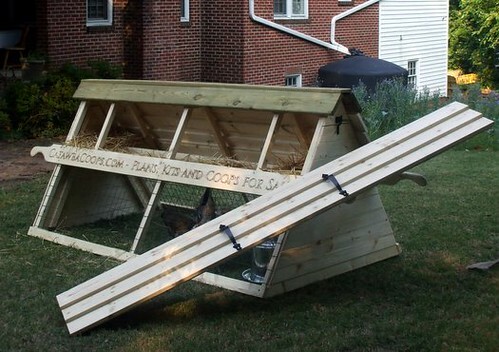 This really only takes a couple of extra minutes, but I do wait until the chickens are upstairs before I move the coop. 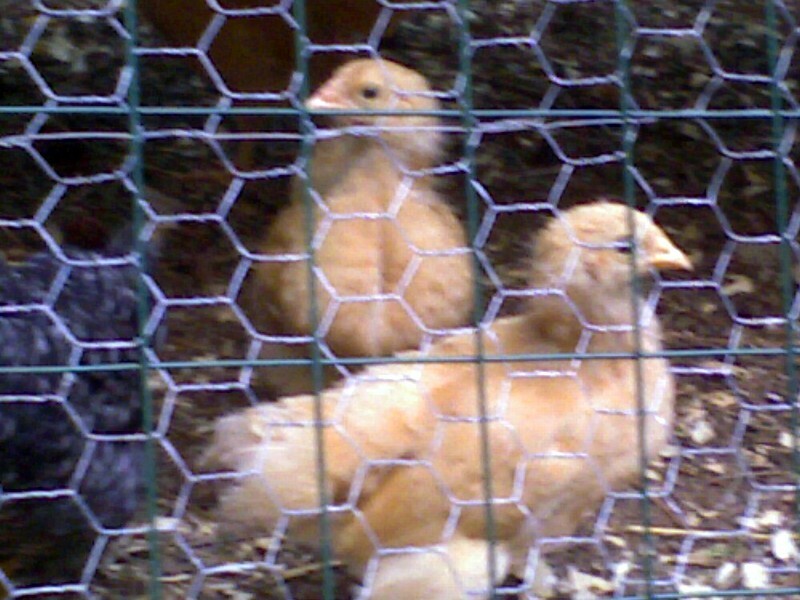 The chickens you see are about 2 month old Buff Orpingtons. 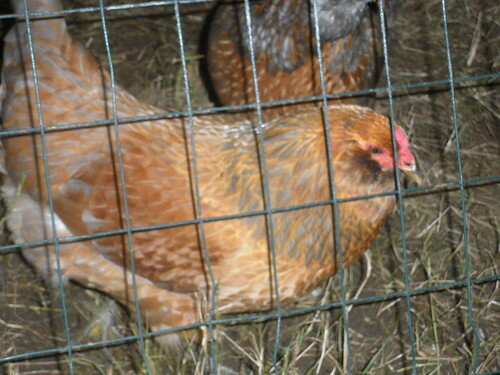 I still have a couple of months to go before eggs. 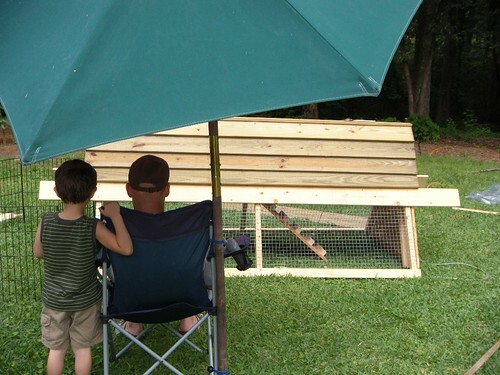 Our four boys (ages 8 to 14) definitely find the chickens interesting and keep asking about eggs. 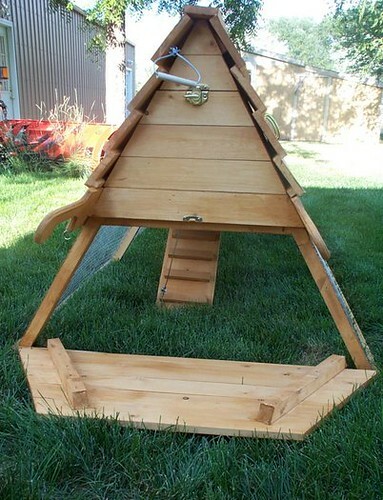 Hi David - I've attached some pics of the coop and my chickens. Everyone is in awe of it! Still have a few finishing touches to put on it (like the handles on that side). 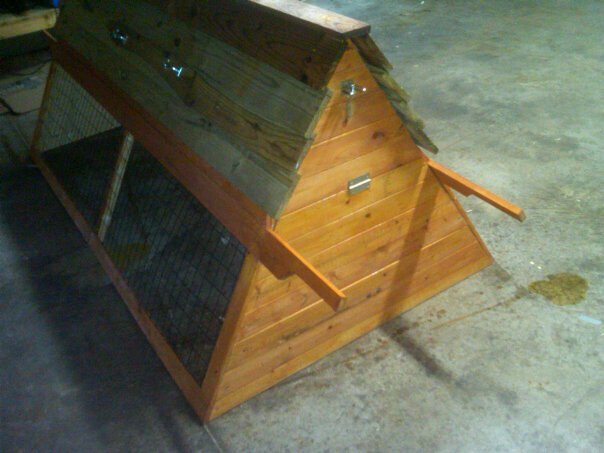 I just finished our coop using your plans. I made a couple of modifications based on prior suggestions and came up with a design for wheels. I thought you would appreciate these pictures. 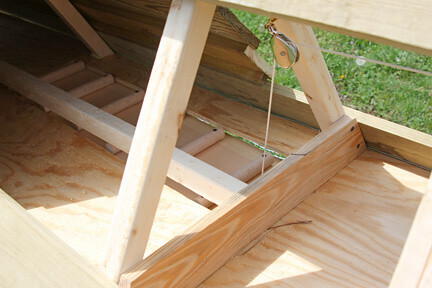 The plywood for the wheel supports was cut from a thicker piece than that called for with the coop floor. 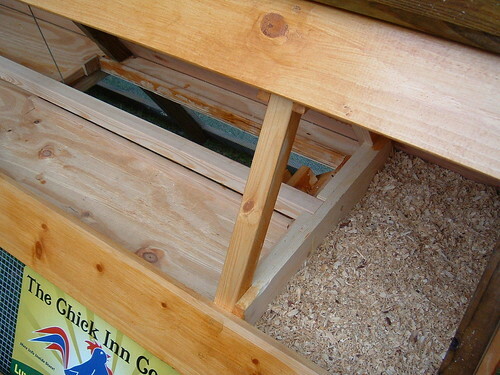 I used another portion of the thinner plywood to build a feeder into one of the coop doors similar to the one on your website using plexiglass. Finally, I also put a layer of the same vinyl coated 2x3 fencing along the bottom; however, later decided to cut the majority out of the middle leaving strips of about 6 inches all the way around. 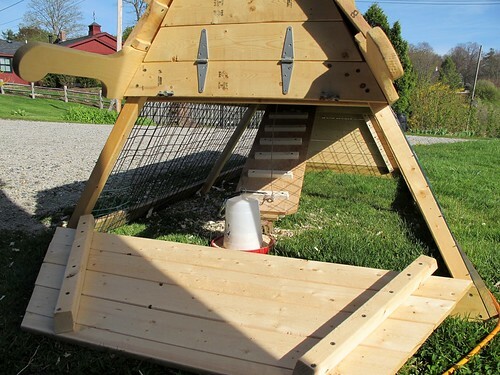 We did this in an effort to keep the protection from predators reaching under the coop while still allowing the chickens the freedom to more easily scratch the ground. Feel free to post these pictures as you see fit. 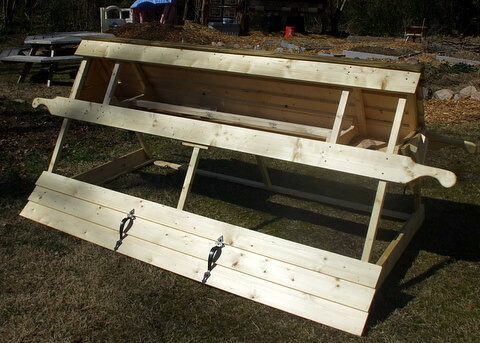 I struggled with the 60 degree cuts on my miter saw and had to make an adjustment on the side panel to "fudge" the design with two 1X3X8's just above the carrying handles. I weatherproofed the seams between the handles and the new lumber with water sealant and window caulk, to prevent leaks. 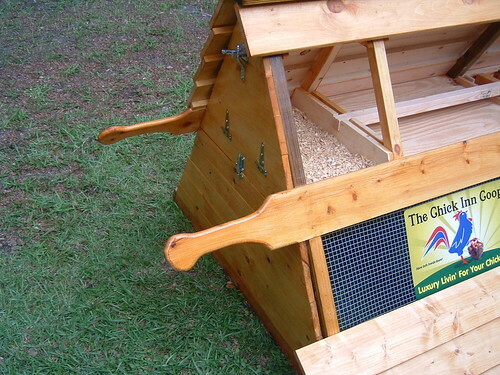 The handles are poplar, the roof is pressure treated wood and the rest is big box lumber. 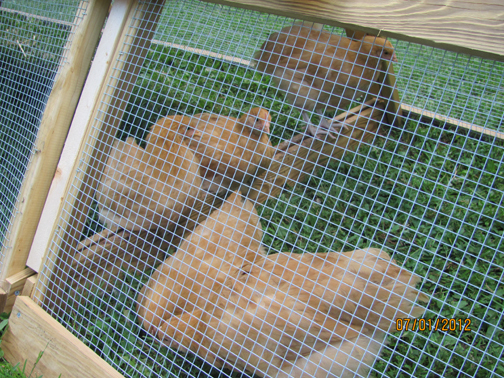 Are three Rhode Island Red Hens are enjoying their new home. The plans were great for a first-timer like myself. 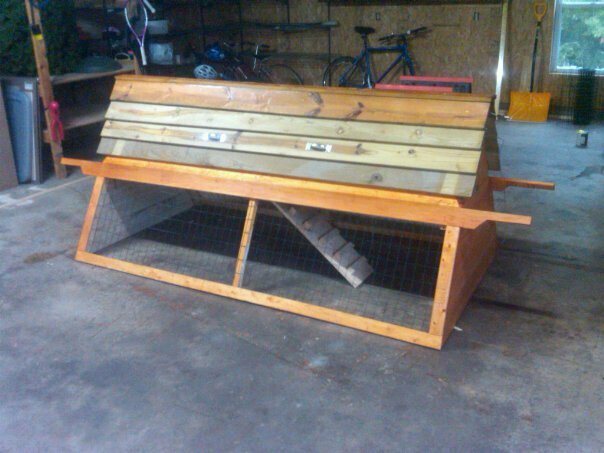 The coop took longer than I expected to build, 7 days, however the end result was worth it. 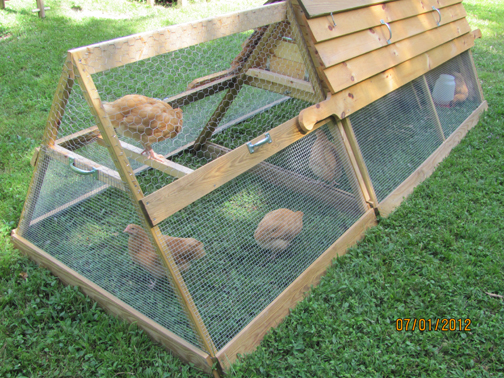 Our three girls love their new home and started laying eggs within a week of moving in. 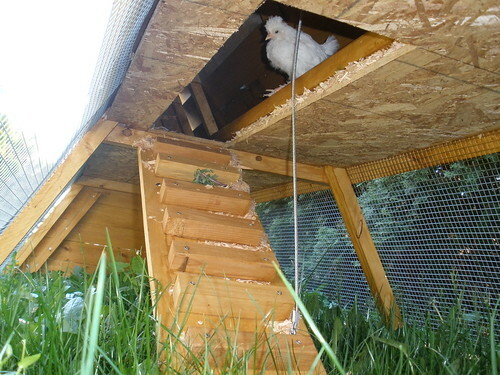 It took them a day or two to get acquainted with the process of going up the ladder to the coop area, but with a little encouragement, they caught on. 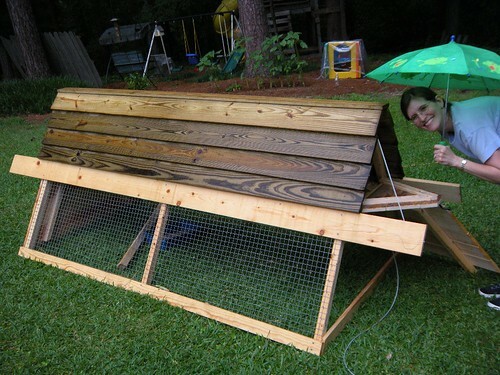 Finished the Chicken Coop! 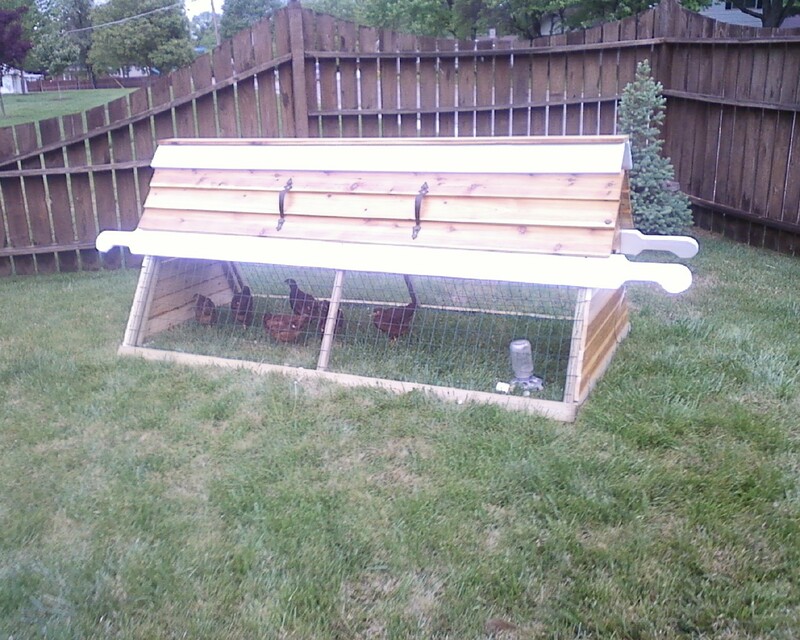 It's holding a couple extra birds until my friend can come pick them up. 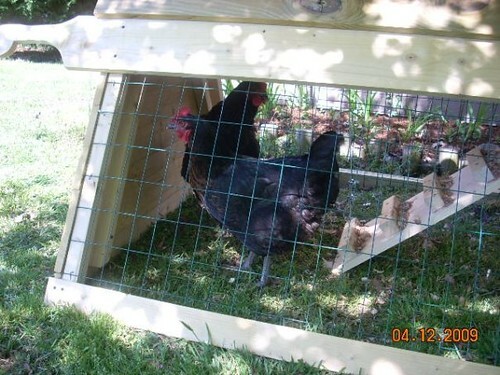 "I have completed the first coop, and will finish the second in the next week. 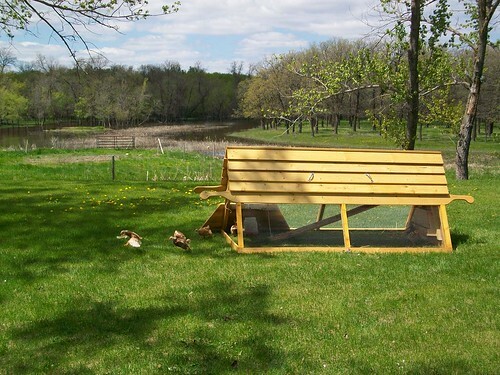 We have 12 chicks and 2 ducks, so 2 coops will make the girls much happier. I changed a few things from your design, mainly the roof panels and the end doors. 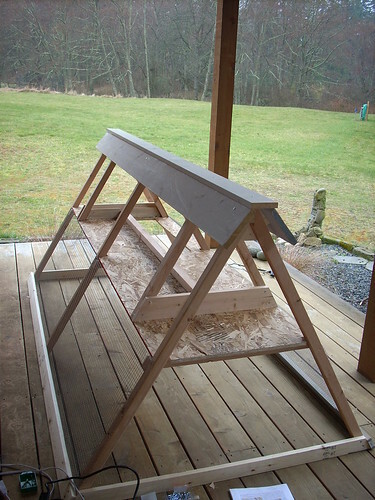 Your plans were spot-on, everything fit nicely, especially nice considering how much pressure-treated wood moves as it is cut and dries. 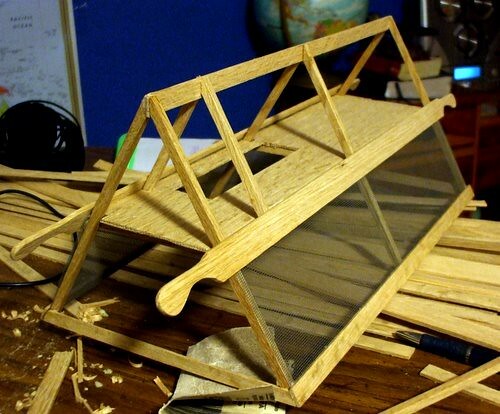 I've never used Sketchup, looks interesting. I use BobCAD 3D to generate Gcode for my model tractors, woodntractors.com - I shut down after the economy crashed since people don't buy expensive models when they don't have money. But it was a great learning experience for me! Keep up the good work. 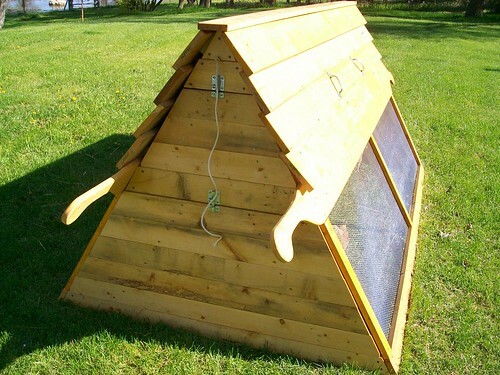 - Geoff"
Dom made some changes to the design including integrating feeding and watering directly onto the structure of the coop. 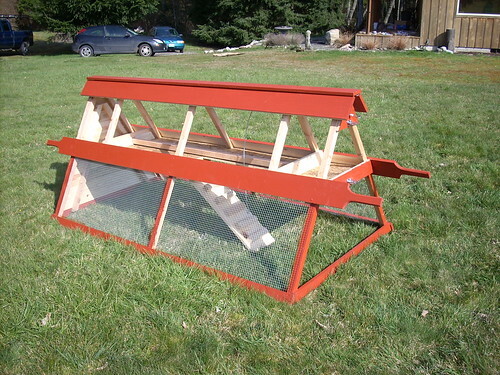 It's all redwood except for the coop floor of course… protected with linseed oil, and plastic bender board on the bottom where it has ground contact. 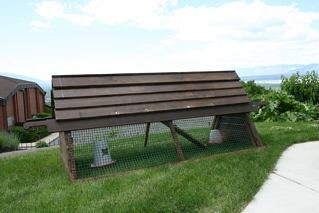 Here are some pics of our newly finished ChickInn Coop. Your plans were super easy to follow and very well detailed. 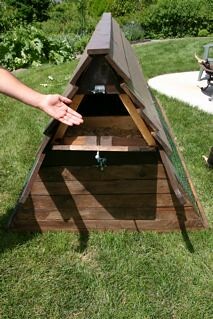 I made a few changes and added a Lil Giant Auto waterer... much easier than bending down to fill a waterer. I had about $170.00 in the build and this included the Lil Giant. 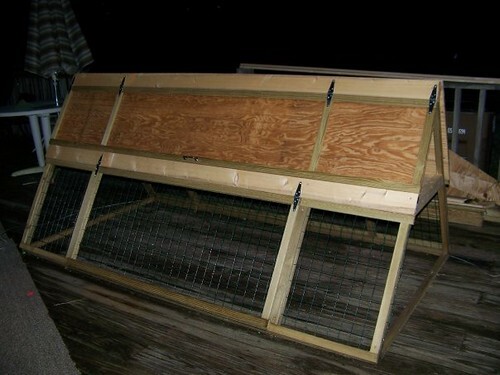 Instead of cutting out the ramp door and using a 1x10, I used 3/8" plywood and left a small tab in the corner attached so the door would not flop around while assembly was done. 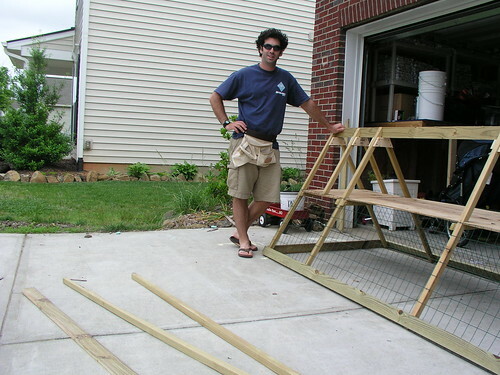 I used two 3" T-Hinges and attached while the board was on my sawhorses. 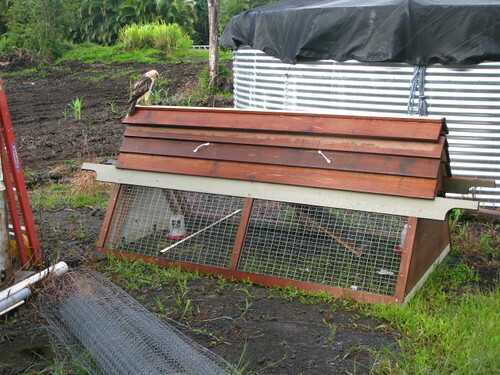 I reinforced the bottom with two 1x2 strips to stop warping. 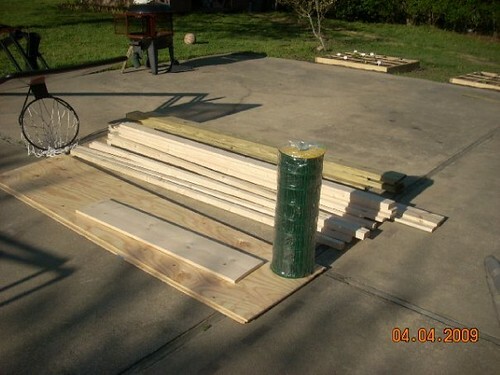 It is just to hard for a prosperous man (large) to crawl around on the floor putting the ramp in. After all assembly was completed I simply cut the small tab with my saber saw. 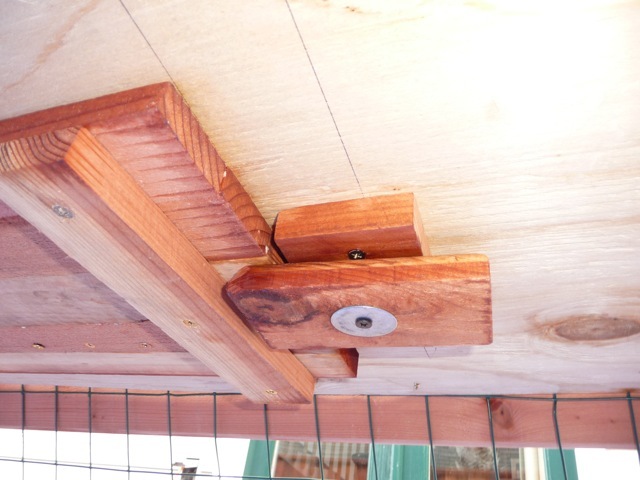 I additionally used my mini router to route the edges off all the roof top boards. I purchased my hardware from www.Hardwareworld.com. I found them to be the cheapest priced on the net. 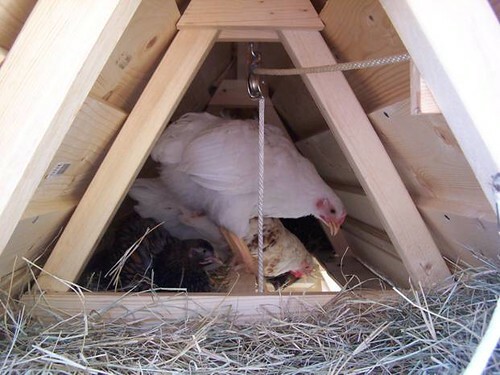 I constructed the coop with only one nest because I believe that the six to eight hens that I end up with should be able to share the one fairly roomy nest box. 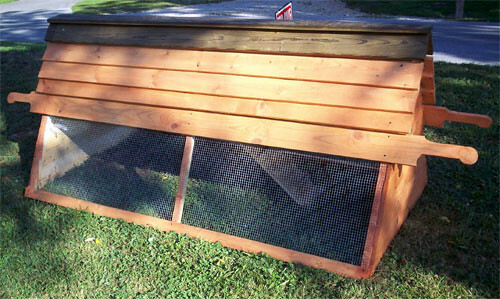 That allowed me to extend the roost all the way to the other end. At the non-nest end, I put a "picture window" in the door (see photo). 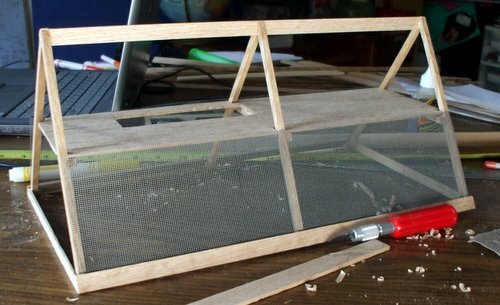 I just cut a piece of 3/4" plywood to fit the opening, cut out the middle of it, and secured a scrap piece of plexiglas with screws from the inside. I backed it with a 1x2" strap for reinforcement. The birds absolutely love to sit in the window watching the world go by whenever they are not down in the run. 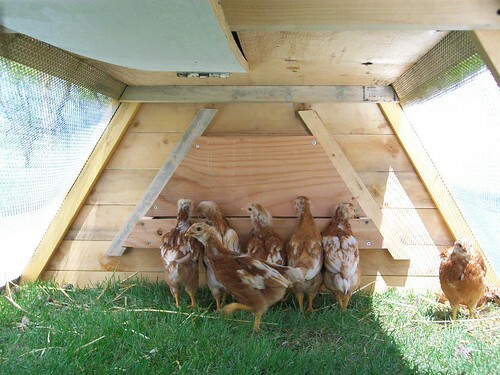 And the extra light should be helpful when they get to egg-laying age. 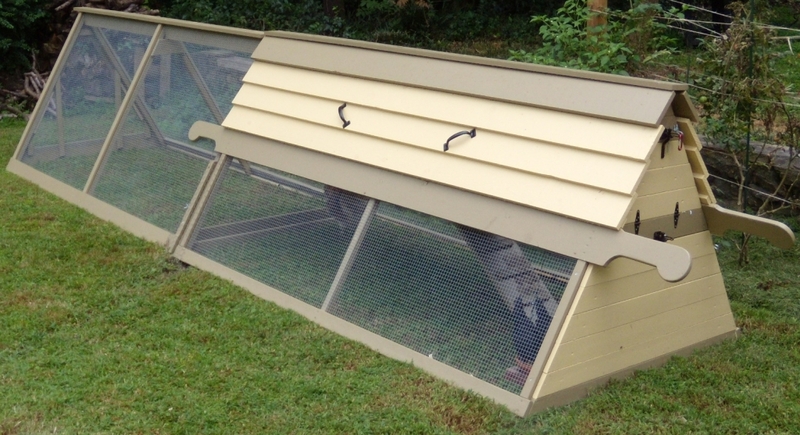 Like a previous commenter, I went with pressure-treated 1x4s for the base boards and a window sash lock and small galvanized gate hinges for the egg door. For pulling up the ramp, I used some scrap exterior telephone wire. 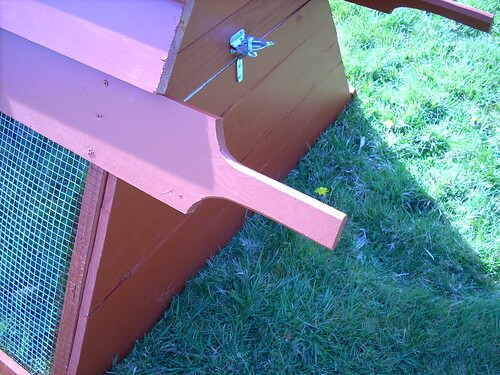 It's very strong, and the vinyl sheath slides easily through a hook eye screwed to the ridge board. 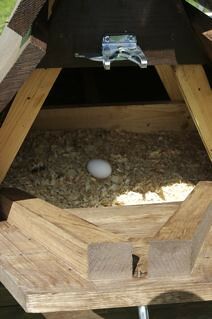 I secure it to a cleat near the peak so that it isn't in the way of the egg door. 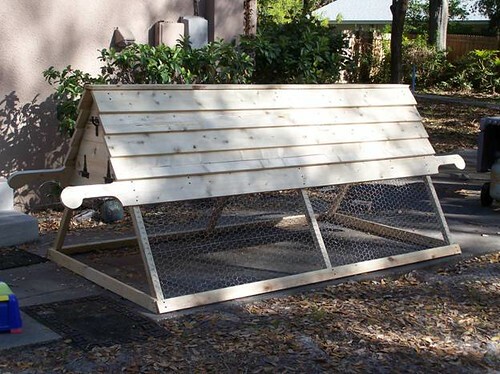 After making a full size coop and learning about my chicks, I decided that I might need to make another. 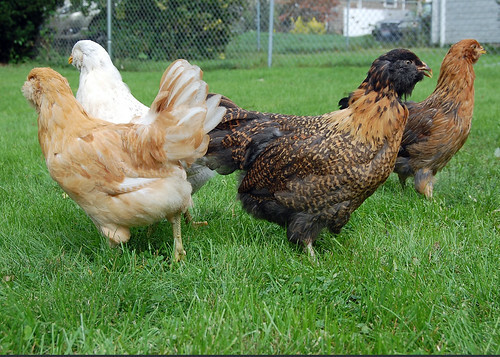 We have 4 Buff Orpingtons and 2 leghorns. 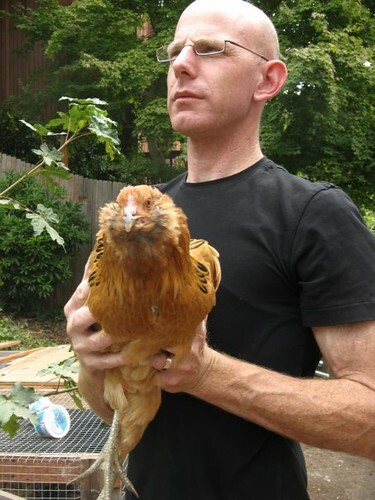 Apparently the Orpingtons can get to a good size. 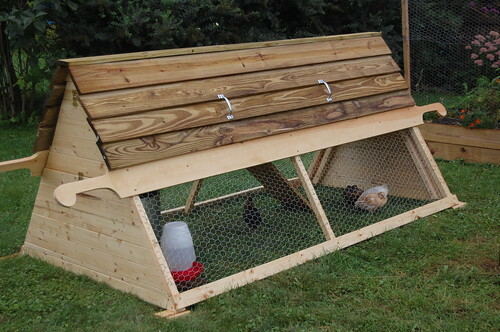 I modified your plans somewhat and made a half-sized coop for the two Leghorns. 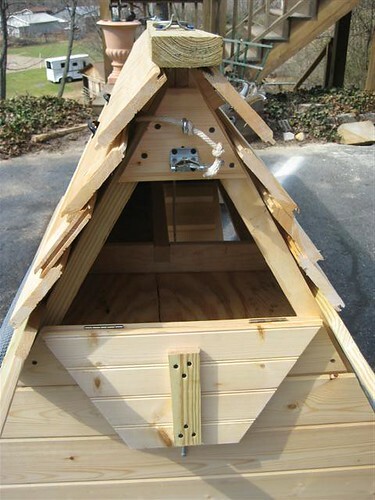 Just one roof side opens and is on hinges. This gives access to the entire upstairs. 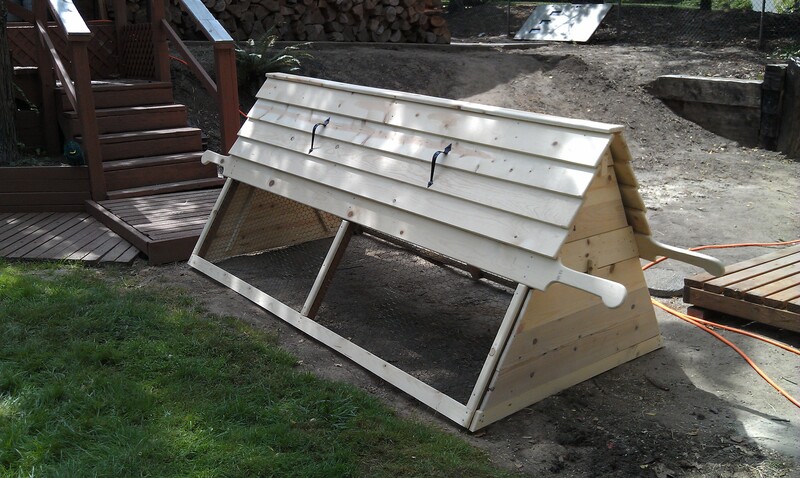 I also fenced three sides on the bottom, so only one side opens. 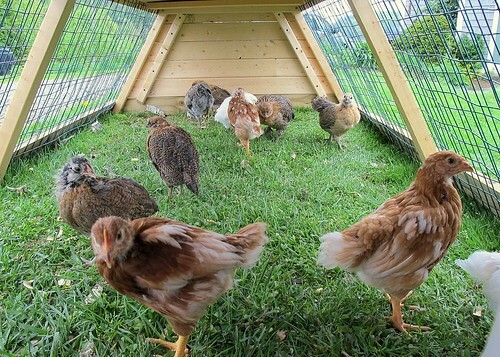 All of our chickens seem happy and are doing well in their homes. 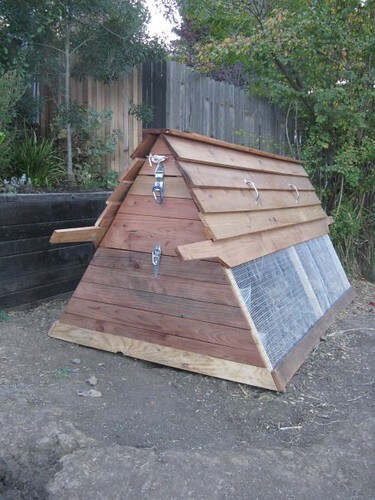 Just a note to tell you what a nicely designed coop you created and how many compliments I have received since building and placing one in my back yard. The snow has them limited these past few weeks. 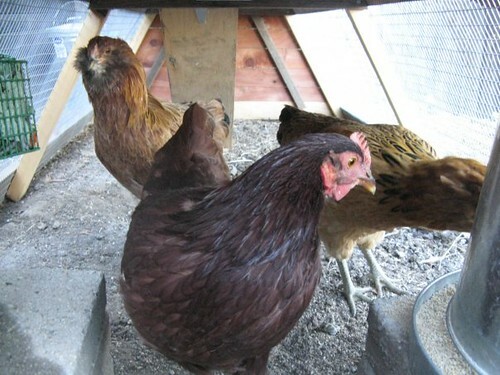 I put a piece of plastic over the west side of the coop to protect them from the wind and so far they are enduring the cold. 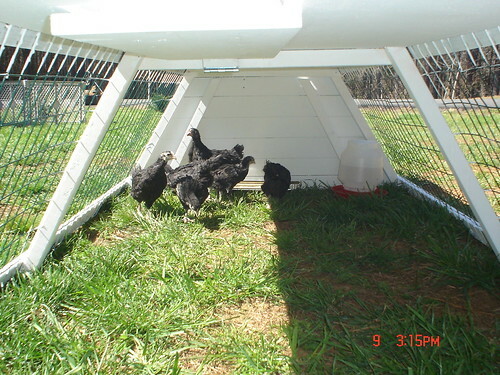 They usually huddle in one nesting box. I’ve contemplated putting a light bulb inside for them to generate a little heat. 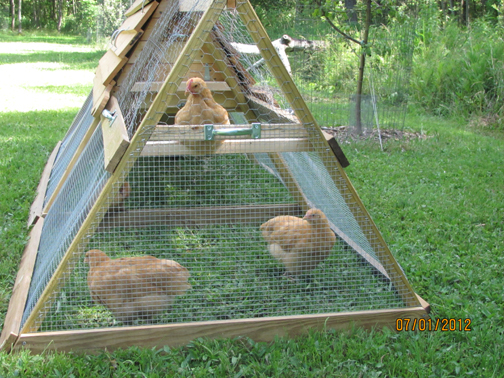 My farmer friends say not to worry, they can handle the cold... but hey, these are pampered ladies you know! 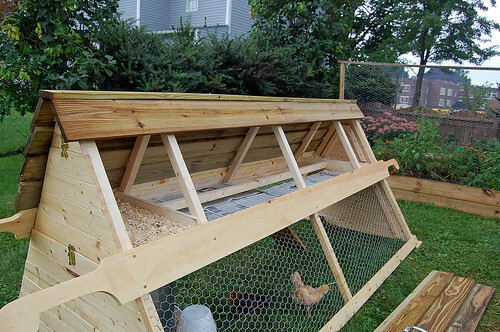 Michael is one of my neighbors and bought the coop plans from me at the local farmer's market. 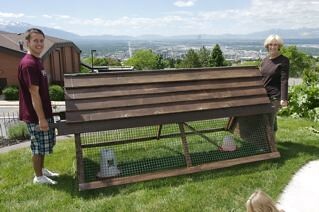 He also came by the house and bought some young pullets from me last spring. 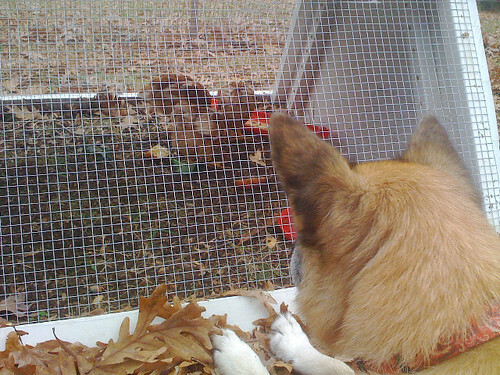 Occasionally I would see him around the neighborhood, and he would joke with me that, "Those chickens you sold me haven't started laying yet!" 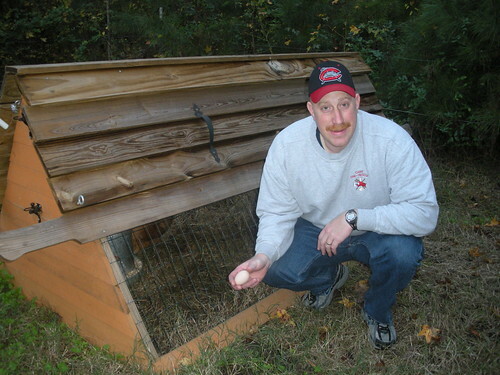 Most recently, I saw him out Trick or Treating with the kids, and his chickens still hadn't started laying. 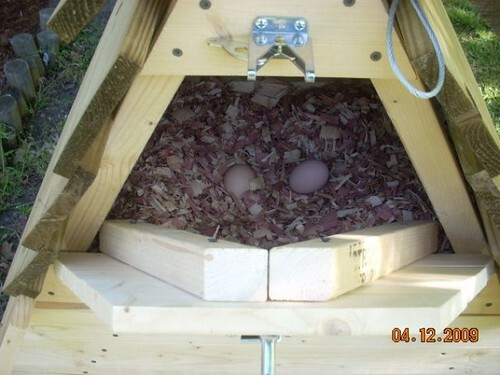 Then just a few days later I get an email with the pics above, "Here are the photos of our first egg." 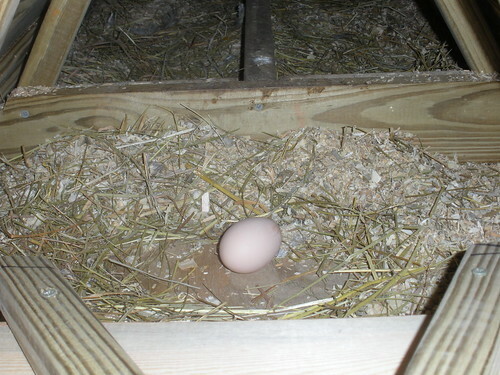 It's always a red letter day when that first egg comes! 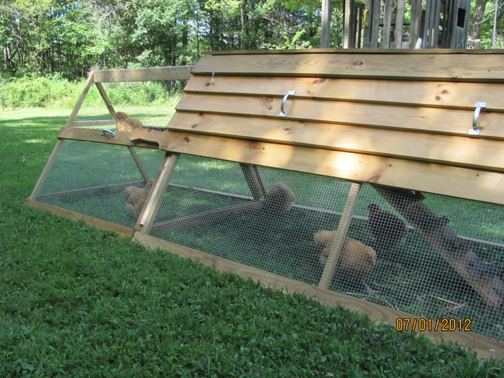 We finished our coop and we - and our "girls" (four pullets) - are just loving it! We haven't quite gotten to finishing the handles... or shortening the pulley cord... or adding the side handles, but we just couldn't wait to move them in! Thank you again so much for the plans that made it possible. You've been so helpful. I have yet another question. 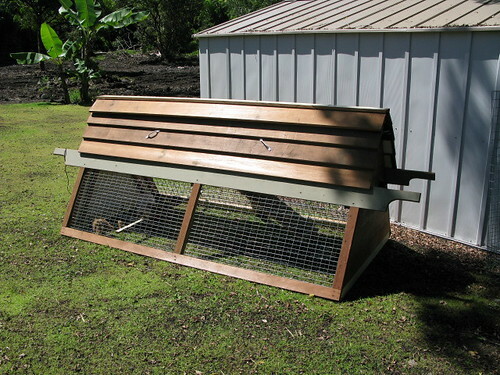 Can you share your "maintenance" routine and what you use for keeping the coop in tip-top shape? Such as how often you change the bedding? 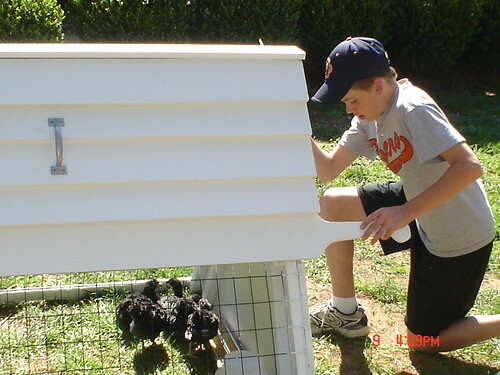 And how and how often you clean the roost/nest box area? 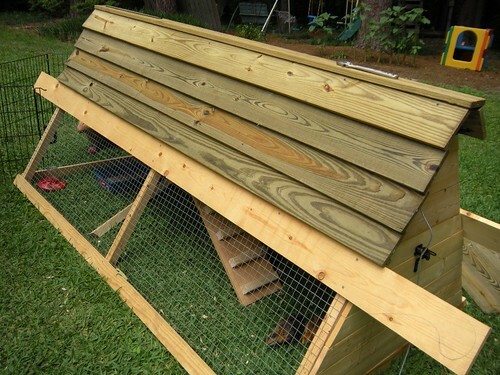 Give your coop a few exterior coats of boiled linseed oil. 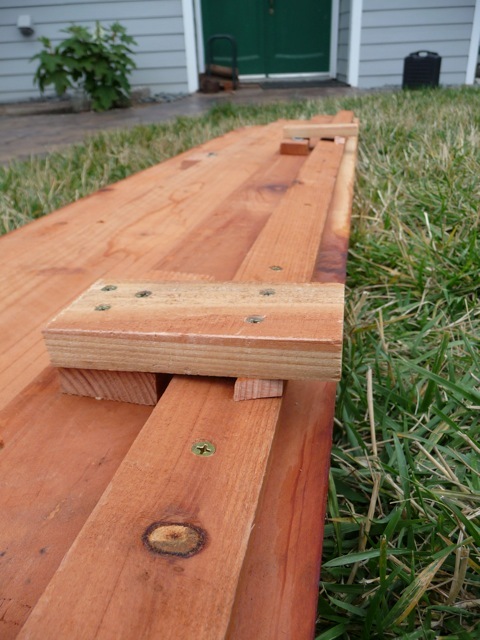 BLO has been used for hundred of years as a sealant and wood preservative. The US Army used BLO of the stocks of firearms in WWII... that's how great the stuff is. Do not get raw linseed oil. Boiling changes the structure of the oil molecule and makes it into a polymer. 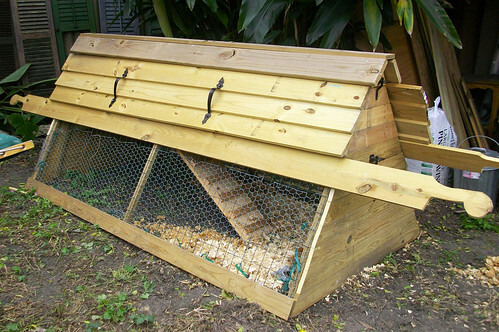 Line the roost area with a thick layer of newspaper. 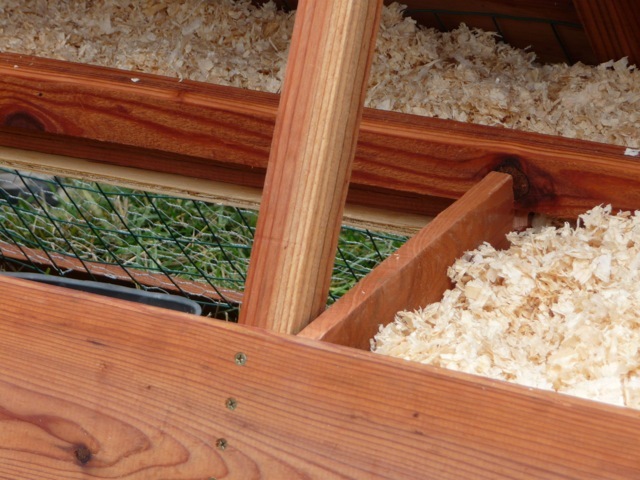 When it is soiled, you can roll it up and put it in the compost bin or the trashcan. We do this once a week or so. 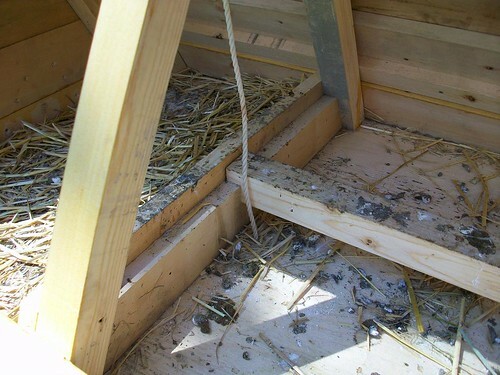 Just keep fresh straw in the nestbox and you should be fine there. 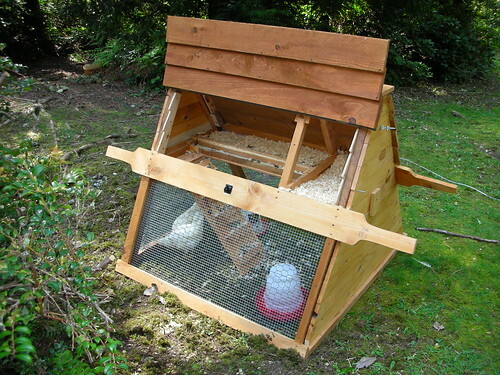 Move the coop 4' to the left or right every couple of days to give your chickens fresh forage. 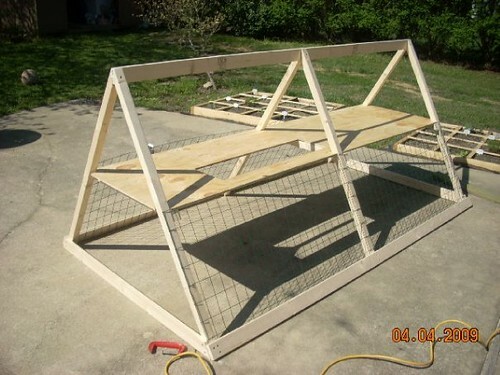 For someone who has no experience building stuff like this before, the instructions were, for the most part, very clear. The only parts I wasn't sure about was for the ramp. 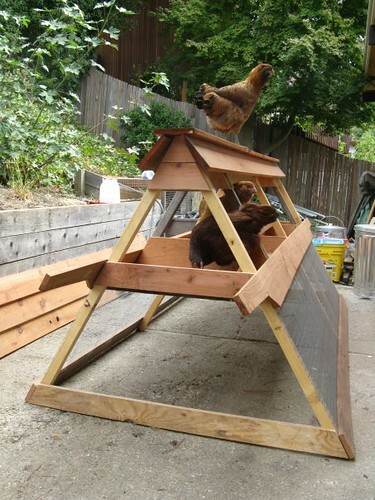 I decided to forego any steps for my birds, but made the ramp longer so that the angle was less. They don't seem to have any problems with it. I also didn't use any pulleys or anything, but just used what I had, and it seems to work pretty darned well so far. 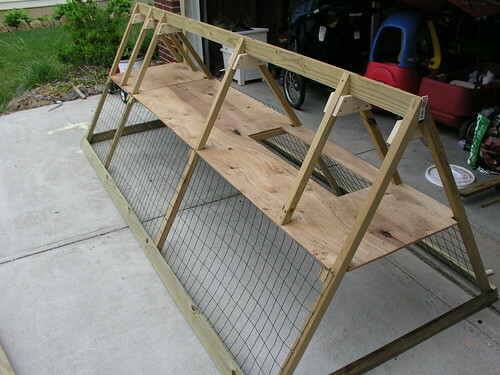 I just don't have any good way to fasten the rope to keep the ramp in the up position. I've been tying it to a handle for now, and that seems to do the trick. 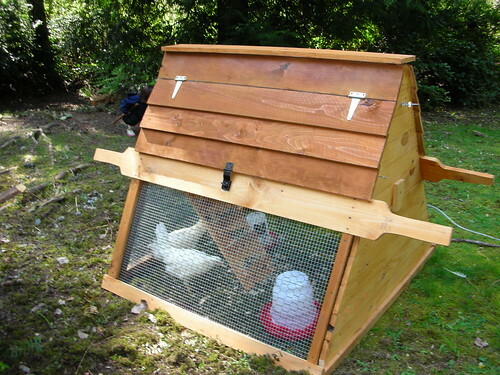 The biggest thing I would recommend though, is to include a gravity feeder into the plans to attach to one of the doors. I made something to fit in between the braces of one door, and it works great! I hope you enjoy the pics. 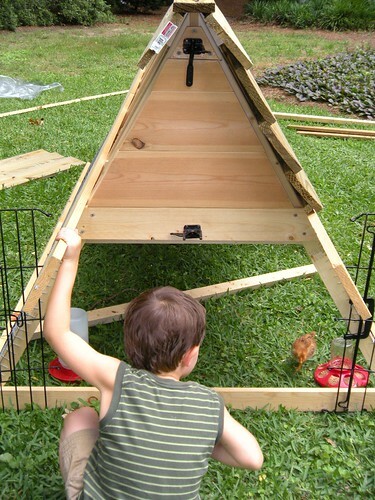 Thank you for the plans and advice on raising chickens! We've attached some pics of the process and final product. 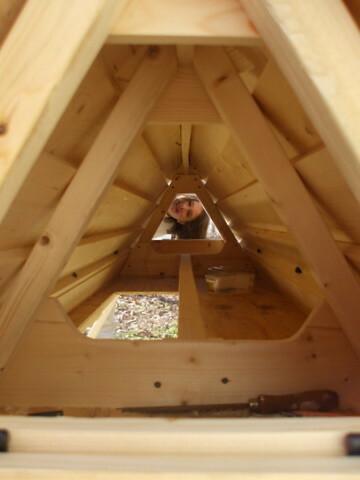 We thought the following disclaimer should be added to the plans, "For every child under the age of 5 'helping' add 2 extra days to the completion time!" 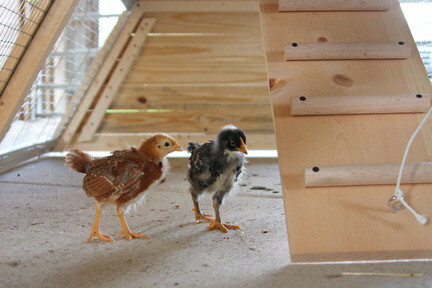 We had a lot of fun, some frustration, but in the end we are very pleased with our coop and so are the inhabitants! 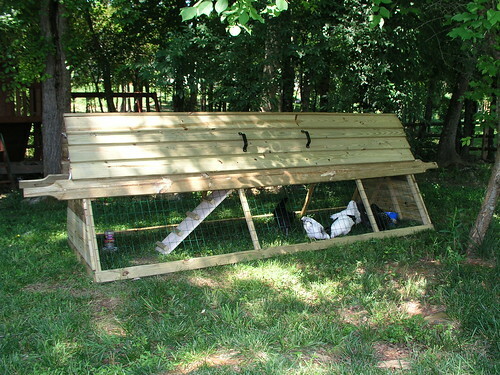 Also, we added 2 extra feet in length to accommodate our 8 large breed chickens. This, of course, caused a few miscalculations here and there but it all worked out in the end. Thanks again! 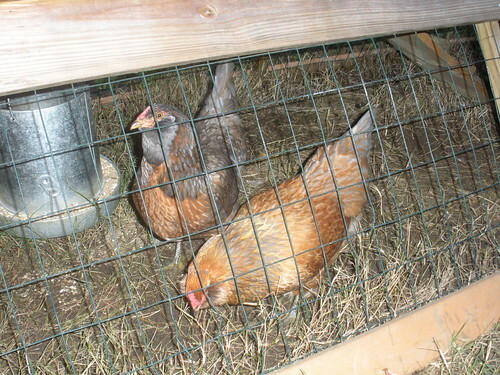 Hopefully in a few months we'll have pics of our fresh eggs. 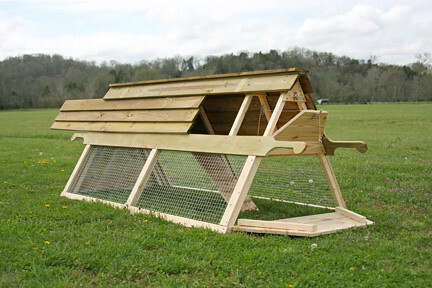 We thought you'd like to see our coop. 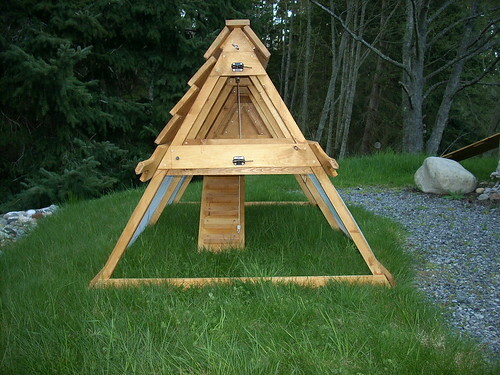 We love it and plan to build another. 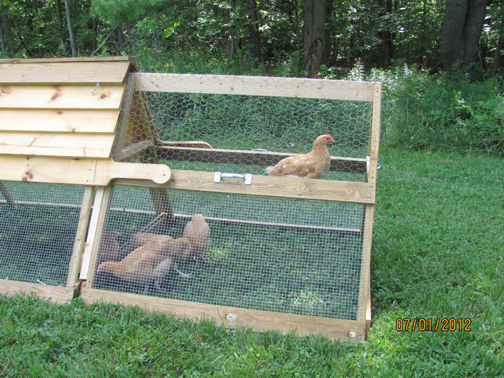 My Catawba Coop is now completed and occupied by three happy little hens (at least we hope they are hens). 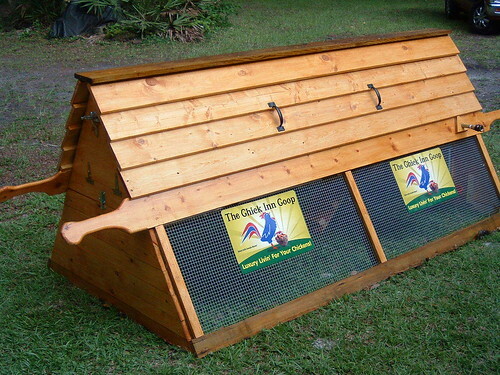 I looked at dozens of chicken tractors, arks and coops online before deciding on this one, and I couldn’t be happier. I think it is unmatched for looks, practicality, and affordability. The instructions were very clear and detailed. I especially appreciated seeing the 3D animation that came along with it, which made walking through the step-by-step detailed instructions that much easier to follow. 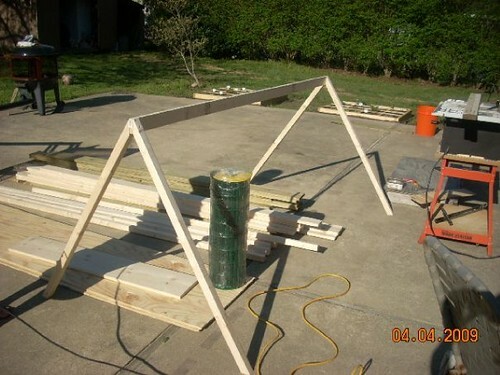 I used pressure treated 1x4 for the base that would be in contact with the ground and pressure treated 2x2’s for the side supports that would be exposed to weather. 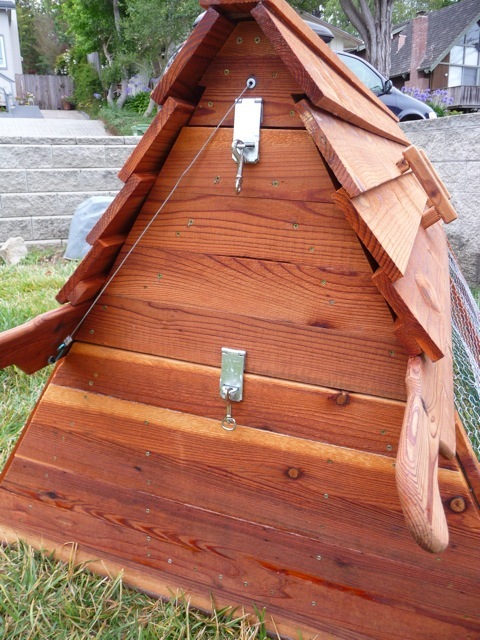 The rest of the coop was going to be painted, but I liked the mix of the white paint and the PT redwood stain, and this way I didn’t have to paint over any of the wire. 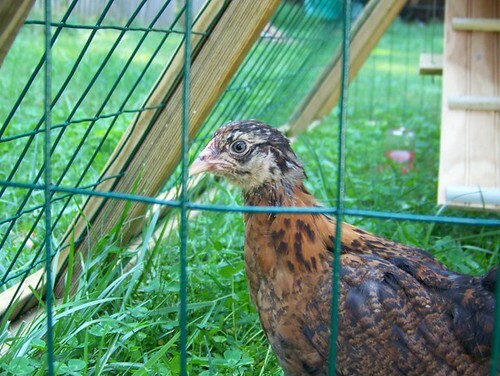 At Lowes I found 24” tall chicken wire of the green vinyl coated variety. I think it will be sturdier than uncoated wire, is better looking, and offers more security than the 2x3 mesh. I followed another builder’s advice and added hinges to all doors. 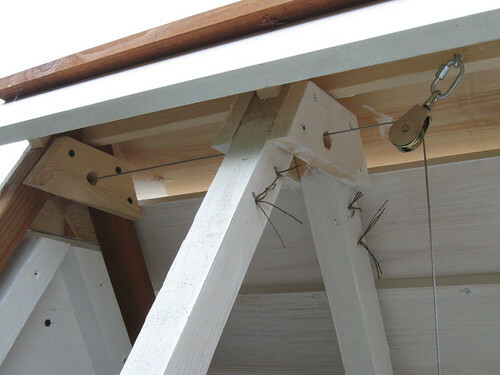 The gate latches are expensive and work best in a horizontal position, so I tried using an alternative. 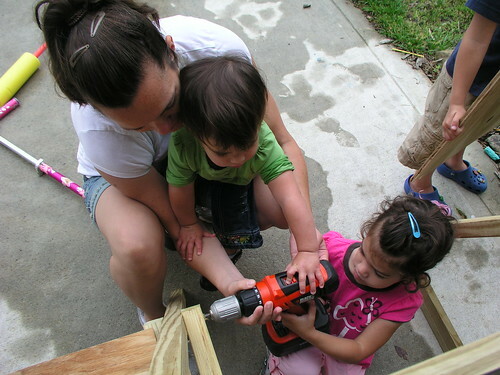 First it was “hook and eye” fasteners, but they were fussy to get aligned just right. Then I hit on what seems to work very well, window sash locks. 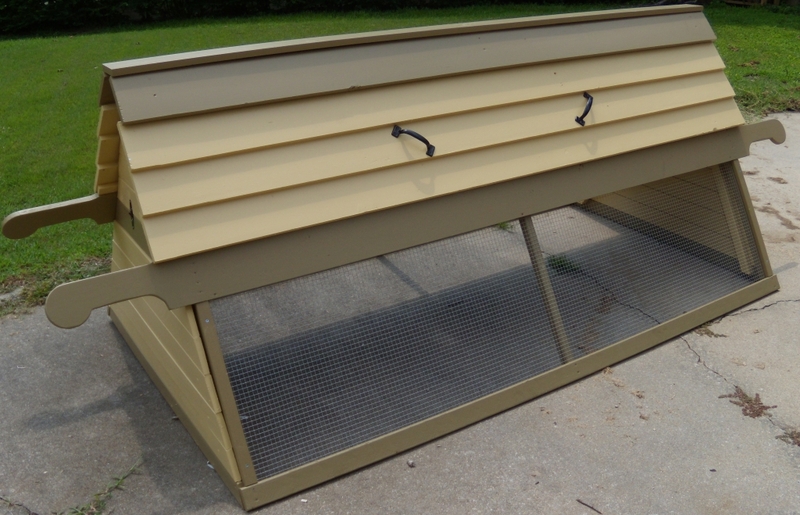 They are easy to find, come in a variety of finishes, and hopefully will be predator-proof. I chose a nickel-plated finish that will not rust. 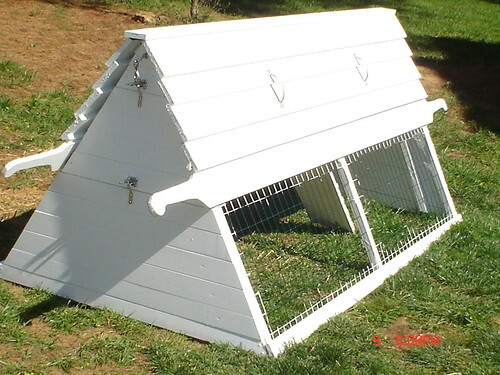 They can be had at Home Depot for less than $2 each, offsetting the cost of the hinges. So far they work really well. 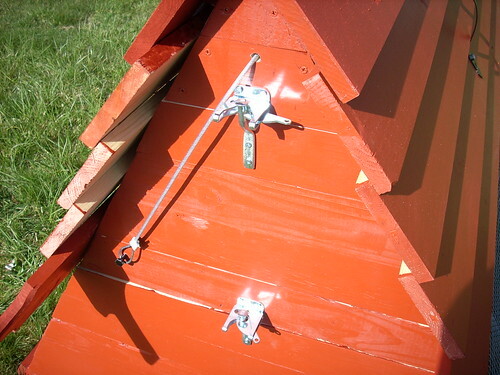 For the ladder mechanism I drilled holes through the truss plates and one through the end piece below the peak. 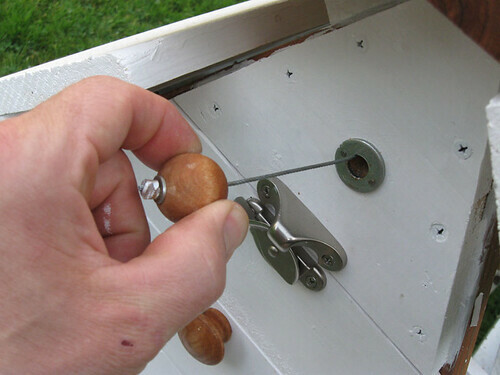 Threaded the cable through the hole, slid on a large wooden bead, a small washer and then the cable-stop. I think it looks nice. 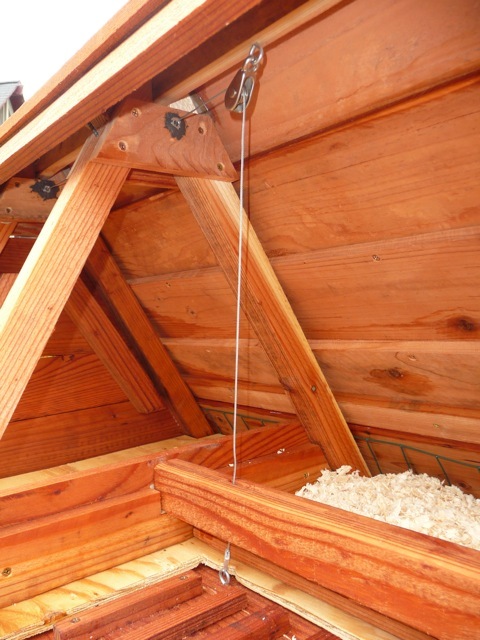 When the ladder is down the bead is pulled flush against the hole. I made a sort of “bushing” to keep the cable from cutting a groove through the wood: a plain old washer that I drilled two little holes through and secured with brads. 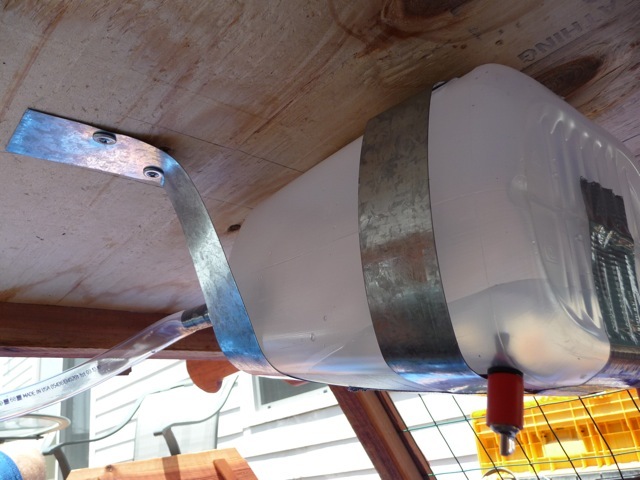 When the ladder is up I secure the bead with a little cup hook. 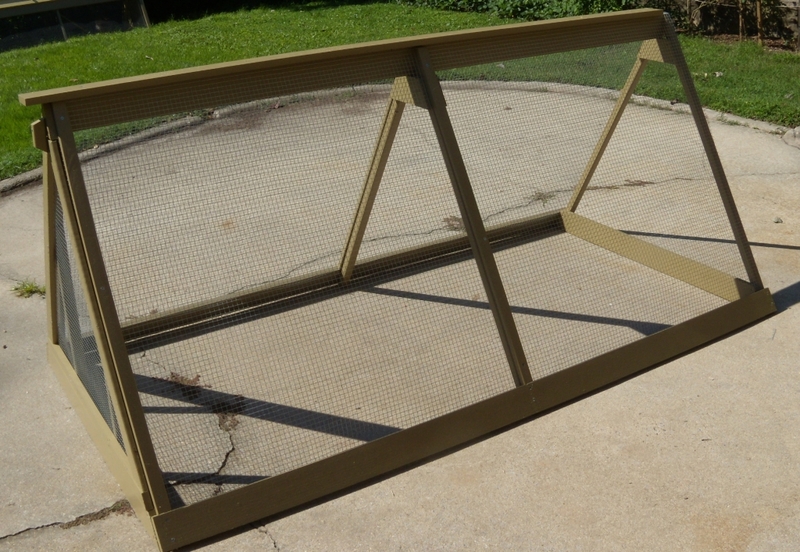 To make a nicer finished look I made trim pieces to cover the legs where the chicken wire is stapled. These are PT 2x2’s that I ripped in half on the table saw then tacked in place. 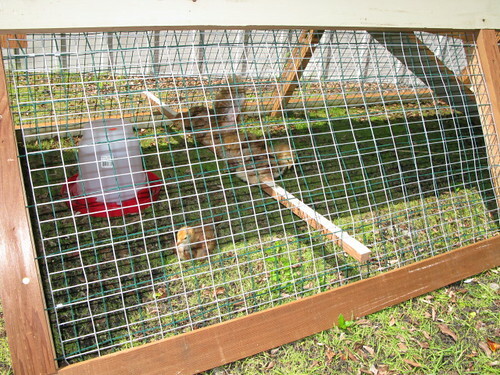 They hide the staples and the cut ends of the wire and should make the wire more secure against being pulled off by predators. 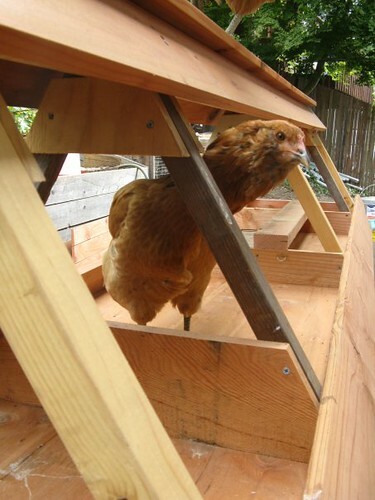 Kristen also has some words of advice for those building their coop about attaching the ramp to the bottom of the coop. 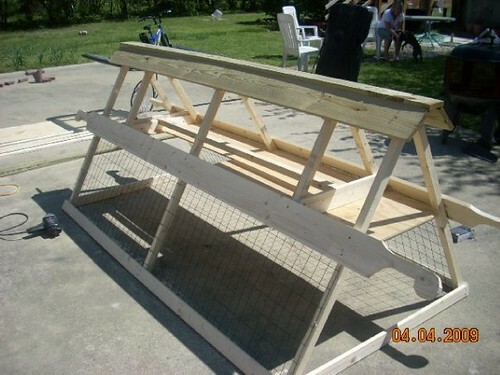 I wanted to send you a few pictures of the chicken tractor I just finished building. 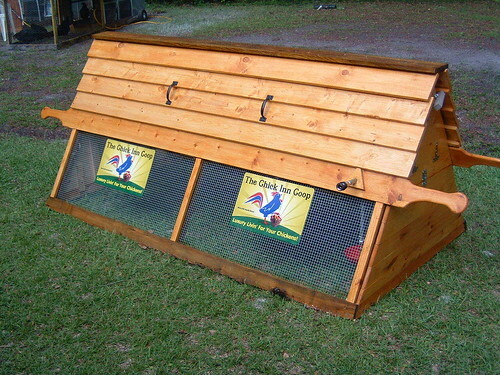 It was challenging for me, as it was my first, but it feels really good to have completed such a nice looking coop! 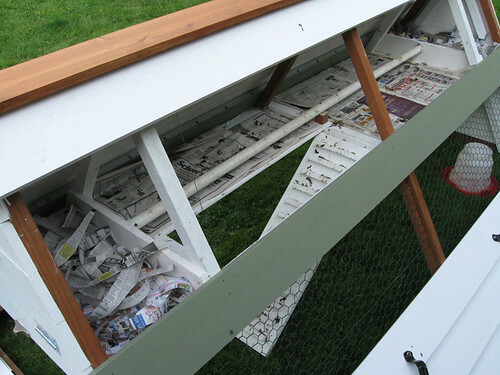 When it came time to put the drop-down ladder on, I first tried climbing under to screw it on, but found that I didn't have the upper-body strength (or coordination) to do that process upside down, holding the heavy power drill. 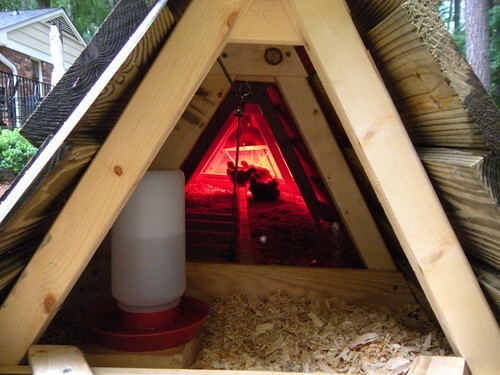 My fiance suggested we just turn the coop upside down and do it that way, and I found it to be really smooth. 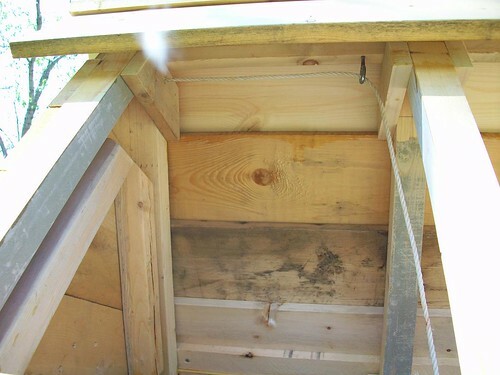 I also used two 3" shallow depth hinges on the ladder so that it didn't wobble at all when pulled up. Thank you again for your wonderful design! 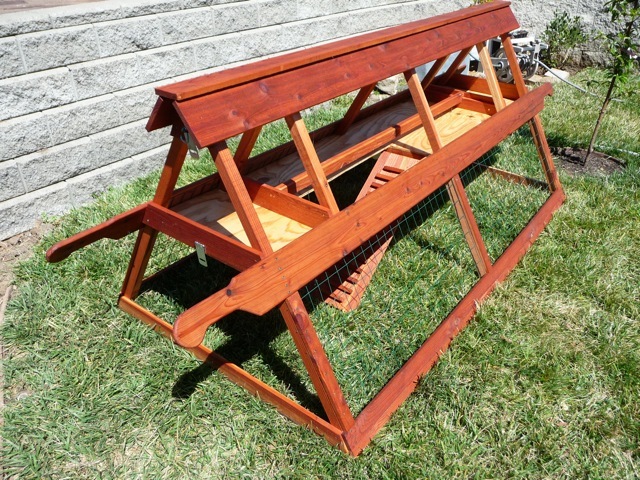 Here's a few shots of the Catawba with a simple stain rather than paint. I love it. 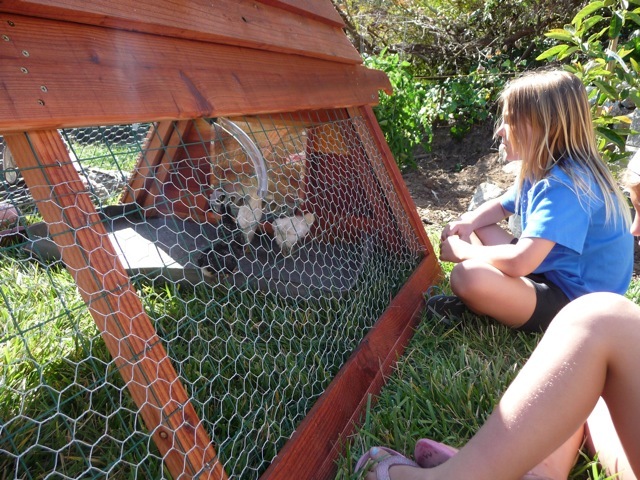 The chicks seem to really like it and feel at home in it already. Each time I build one, it gets easier. I'm working on number four now. 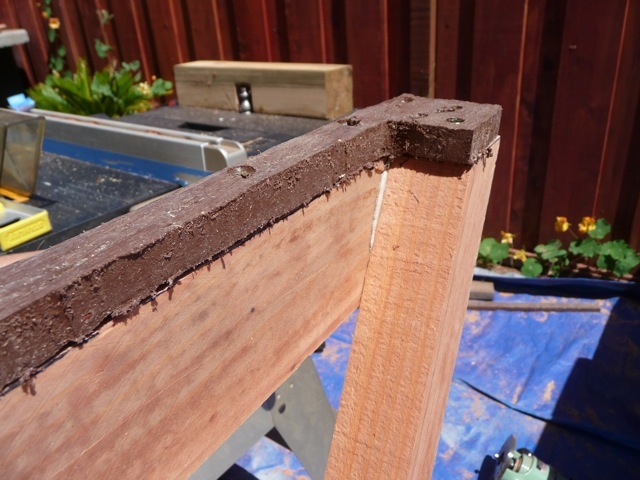 I recommended to coop builders that if you are looking for a natural wood sealant, please consider boiled linseed oil. Artists have used it as an oil paint pigment binder for hundreds of years. Don't get the unboiled stuff. Boiling the oil starts a polymerization process which makes it dry more quickly and more impervious to weather. Do not throw rags soaked with BLO in the garbage. The drying process is exothermic and releases large amounts of heat, which could cause a trash fire. Hang the rags up to dry someplace well ventilated. Never leave BLO soaked rags piled on top of each other. 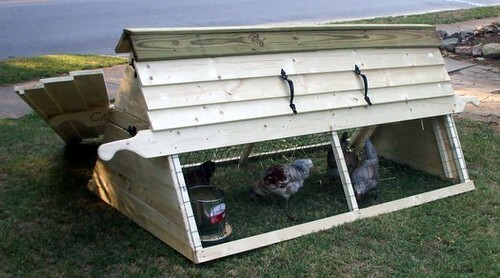 Hi Dave, Thanks for the chicken coop plans. They worked like a charm. I gave my miter saw a workout and am glad I have a table saw. 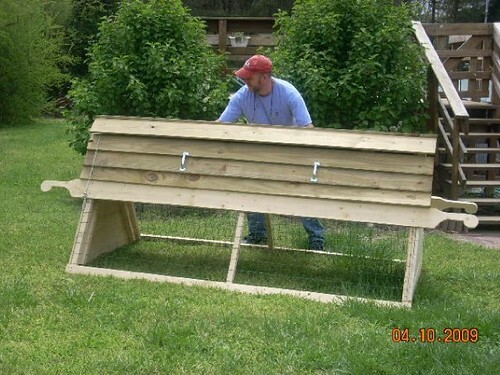 I hope to get some chickens over the weekend. 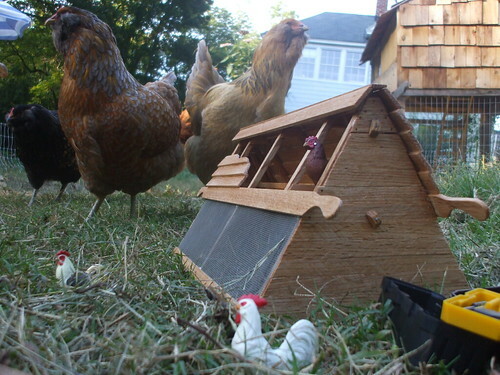 Looks like the chickens are really doing well Jim, judging by the last picture in this series you sent me. 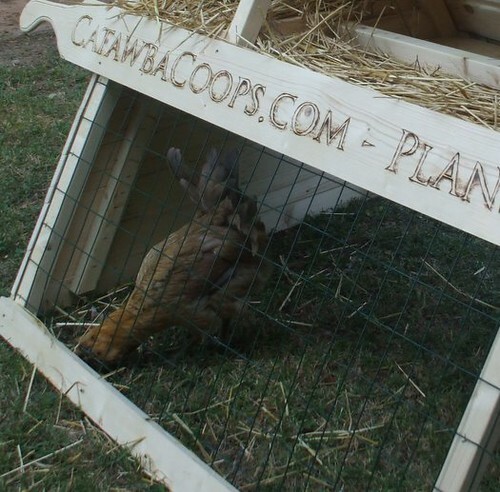 Doug has some some suggestions for prospective Catawba ConvertiCoop builders. 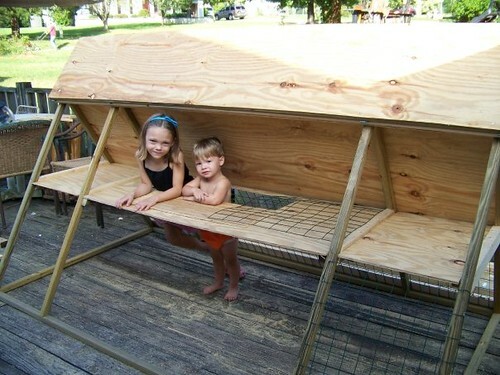 Why not marine grade plywood for the sides? Less cutting perhaps but not as pretty. We put hinges on the top access doors since it seemed unneeded to remove those small doors. Access is very good and it gives the ability to close it quicker. 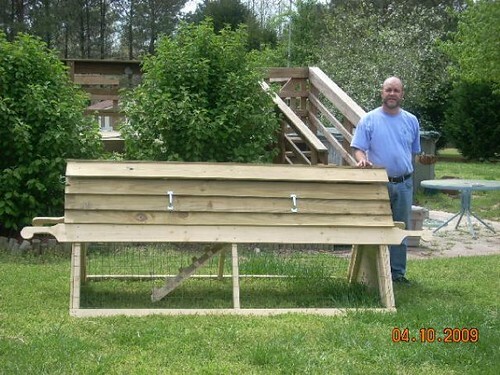 Mark sent me these pictures to show off his "first big woodworking project" and to tell me that his wife is thrilled with the new house for their chickens. He says that he had so much fun building it, he wants to build 10 more. Maybe this could become a great sidebar business for Mark. 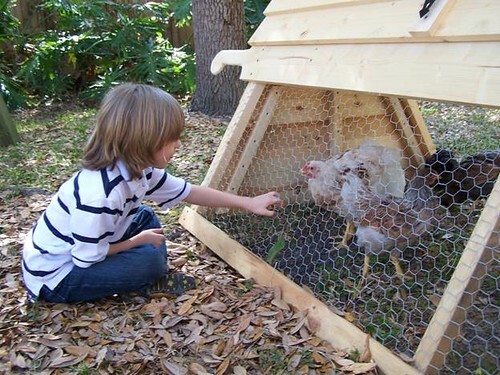 Pamela brings up a point in her email that, because the coop ends and eggbox doors are not attached, small children should be supervised when collecting eggs. 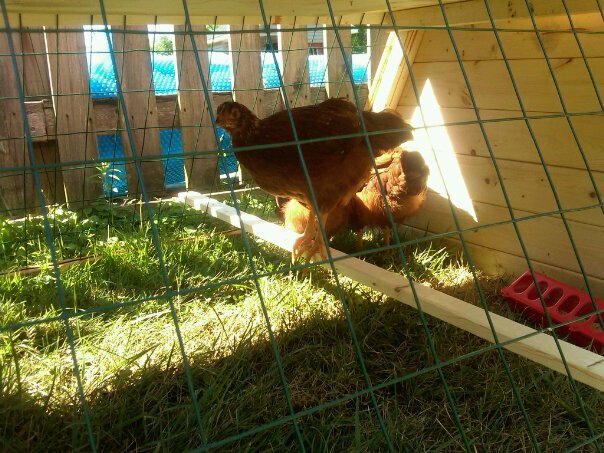 I thought it’s time I write as we finished building our coop—your coop—about two weeks ago and we love it. Wanted to send you some pics too! 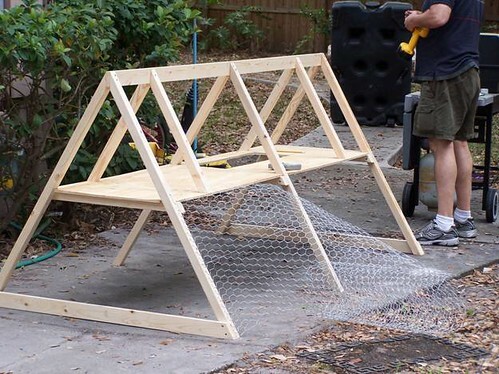 What a fantastic-looking and easy to build design you’ve made. Thanks so much! 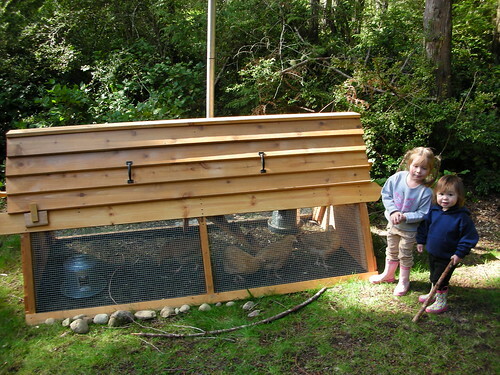 I love the simplicity of your wood door “hinges,” but we ended up putting metal hinges on the egg doors because my kids collect our eggs, and I wanted no chance of one of them coming screaming with a broken foot because the egg door fell off. 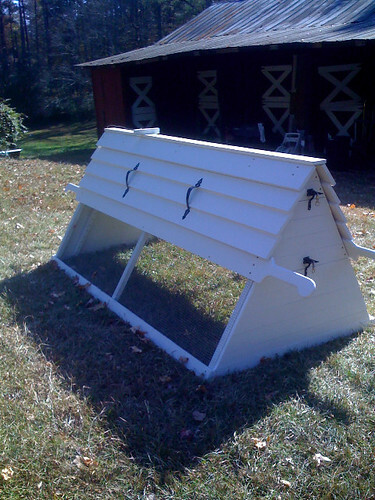 The coop is just great and I’m a whiz with a miter saw now. 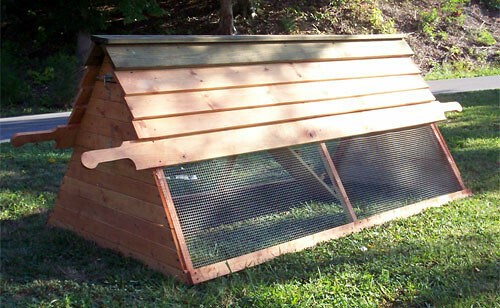 I realized that a good chicken coop engineer (yes, I like that title) had to be able to work both inside and outside of the blueprint. A good SEO has to do the same thing. Sure, you can try to simply get links from all of the same places your top ranking competitor has, but at the end of the day if you want to outrank that site you better be willing to get creative and find work arounds when you feel stuck... 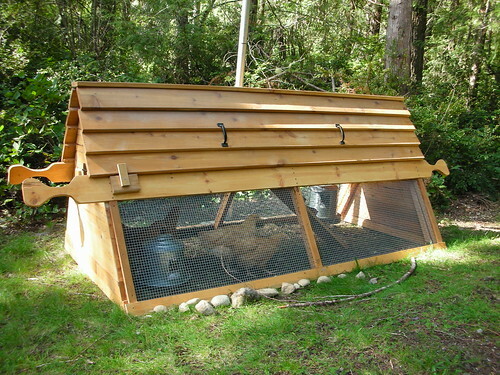 So, if your SEO mojo feels like it’s in a rut go build a chicken coop for some creative inspiration. 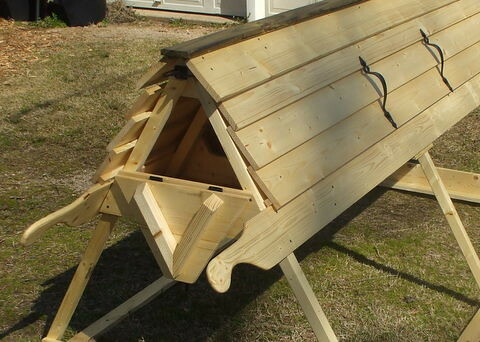 I have been so active in the changing of the Wake Forest town ordinances, the fine folks at the Farmer's Market have invited me to sell my chicken coop plans at their venue. 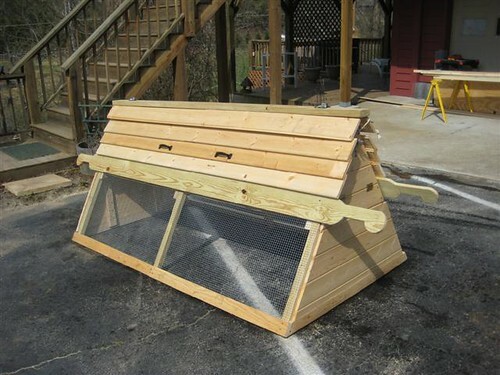 Since I don't own a truck, and really am not interested in removing all the seats from my wife's minivan every Saturday morning to schlep a full sized coop to the market, I designed TinyCoop to sit on a table. 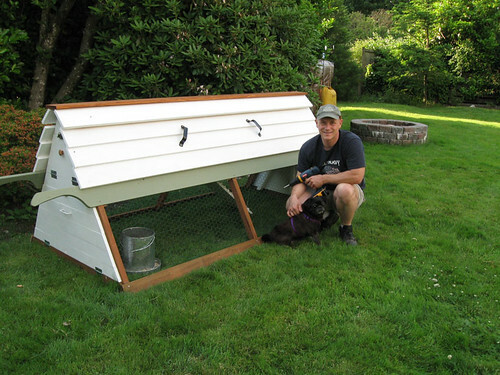 TinyCoop is an exact scale replica of the Brougham ConvertiCoop, but it's only 20" long. 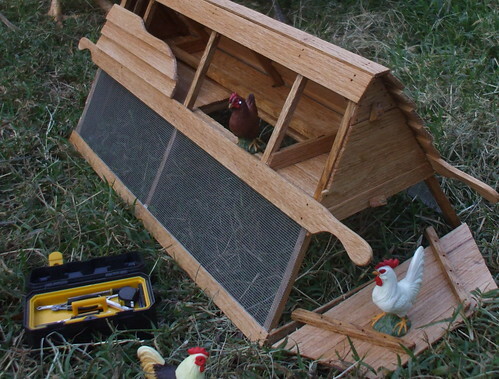 It's scaled 1" : 4.25mm, which I know may sound odd, but it lets me rip boards from 1/4" 1/2" and 3/4" oak that match the size of the coop perfectly... just a lot smaller! And I like working in metric better than empirical measurement. Honestly, which is easier for you to figure out; 2 5/16" or 59mm? 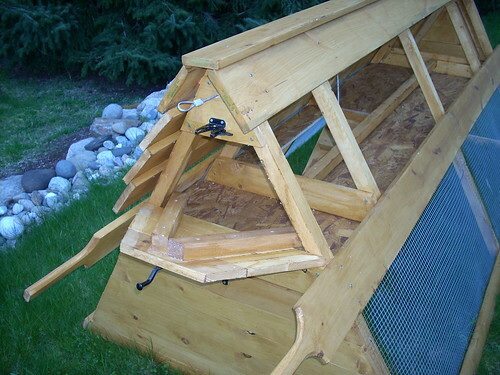 I was having a hard time getting the roof back on because of the angle plus weight. 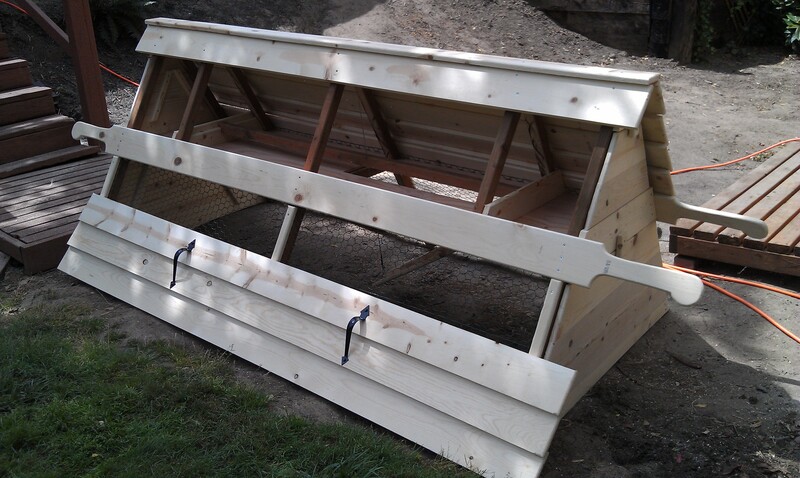 We cut one of the roof sides in two pieces and put extra handles on, and it is much easier to manage. 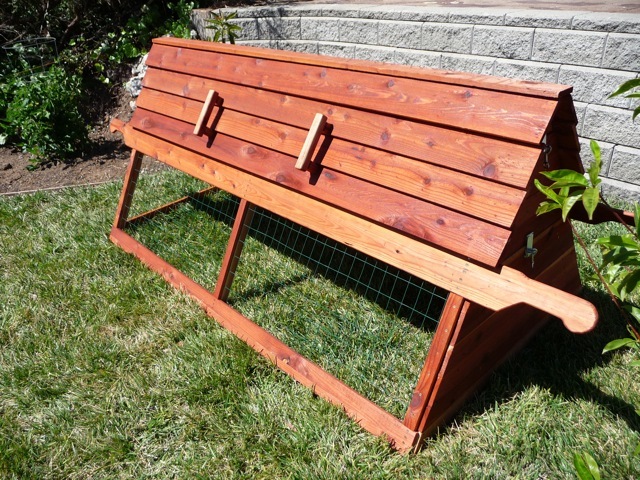 I think this is an excellent idea for someone who may not be able to handle the full weight of one of the sides. 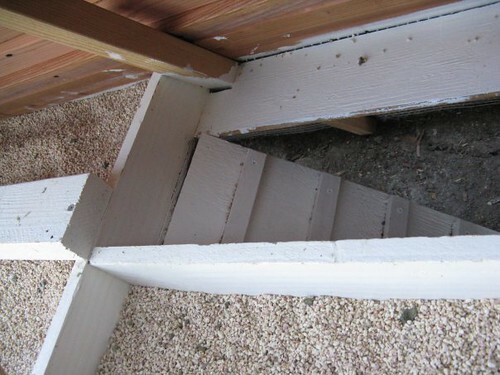 The small gap could be filled with a weatherproof gasket like those found on the bottom of screen doors. 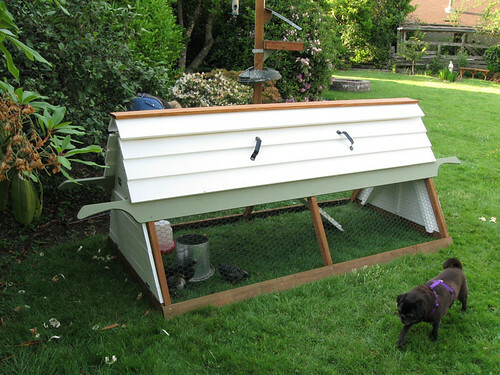 Notice that she has also painted her coop white. 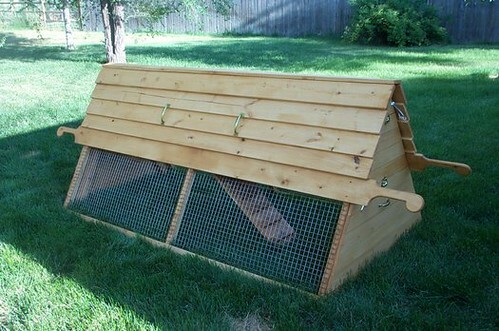 This will keep it cooler during the summer. 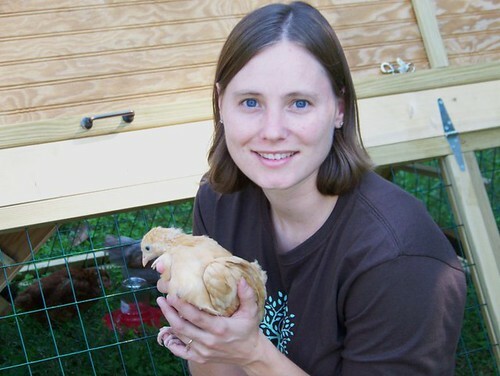 Emily has been a most outstanding advocate for chickens in our little town of Wake Forest. 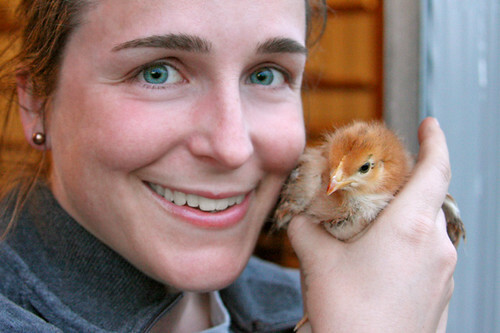 She was instrumental in getting the chicken ordinances changed in our community. Her husband Mike, never one to leave well enough alone , fooled around with his Catawba ConvertiCoop plans. 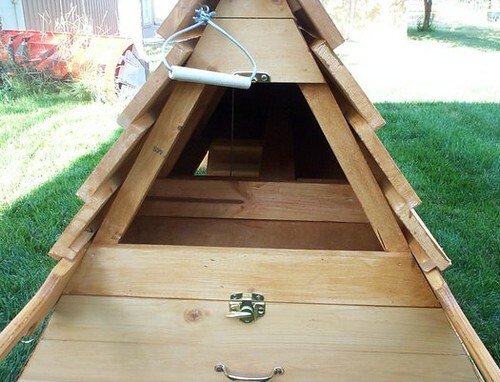 He used my dimensions for cutting the lumber, and came up with this unique piece that reflects his own personality. 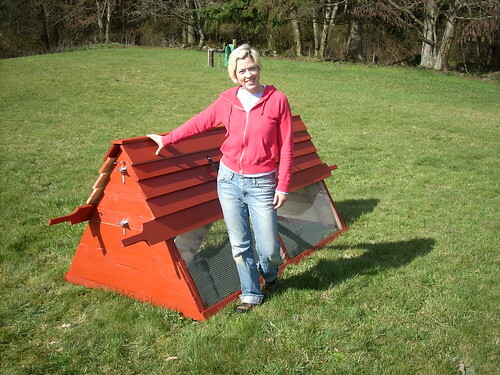 Jill was one of the first people to purchase coop plans from me. She recently posted these to her Facebook profile. Thanks for letting me post them Jill. 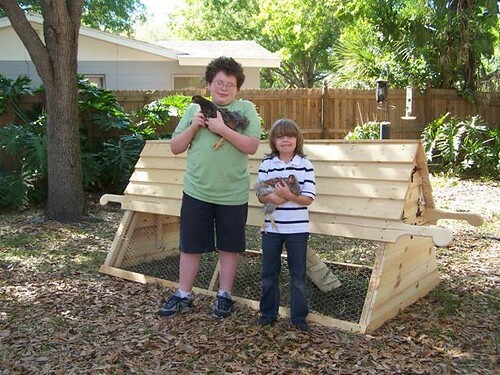 Joe wrote me about his coop project. 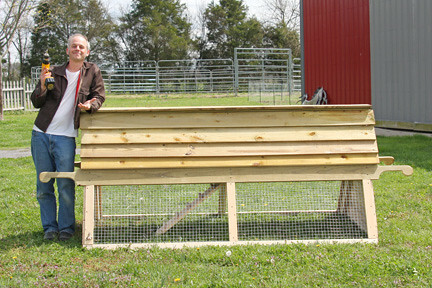 He saved a substancial amount of money by using materials that he had left over from another project. 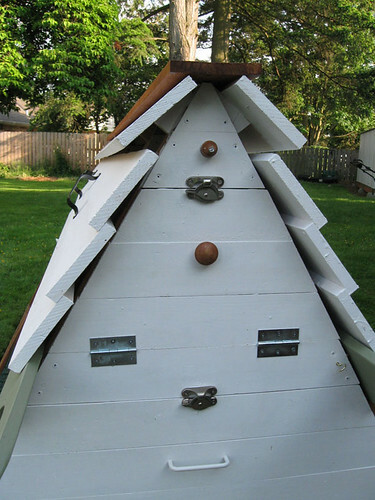 All of the siding was used redwood, so my costs were just over $100. 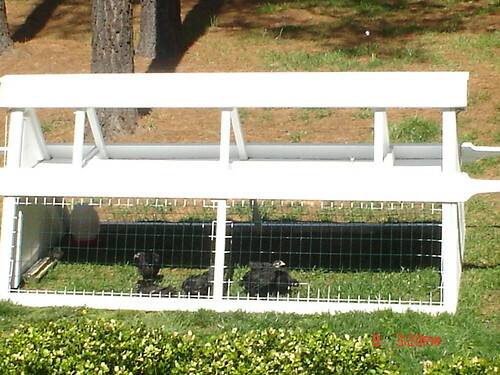 I had to add smaller wire to the sides to keep the chicks in... and off of my porch. I have to put them in the loft by hand each night where the light is located. 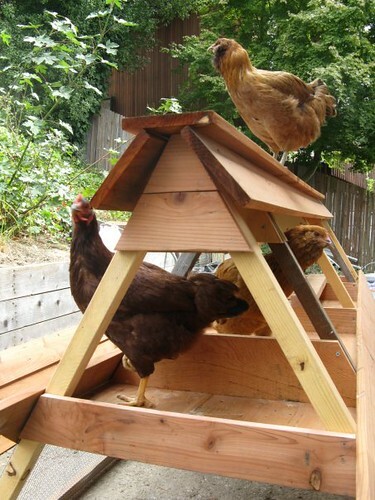 I also added a perch for them sit on during the day. 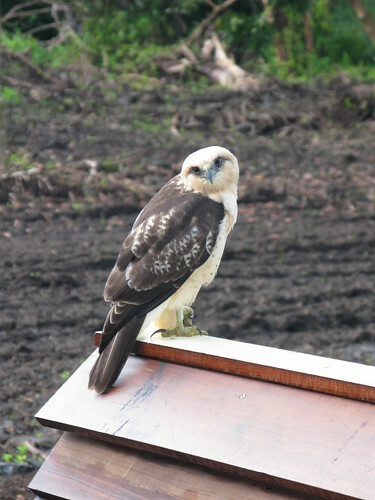 Here in Hawaii there is a endangered hawk locally called an 'Io that likes to land on top of my Catawba ConvertiCoop. The chicks of course, run upstairs when the hawk is around. I've attached a couple of pics if you're interested. Wow... look at that dark, rich volcanic soil.I'll bet you could grow anything in that. How about sending some of that beautiful soil our way Joe? 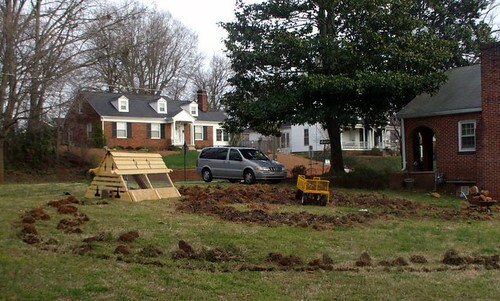 It must be better than our North Carolina red clay. 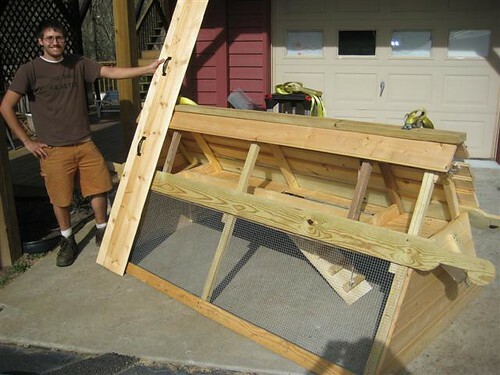 "My 15 year-old son finished the coop in just a couple days. 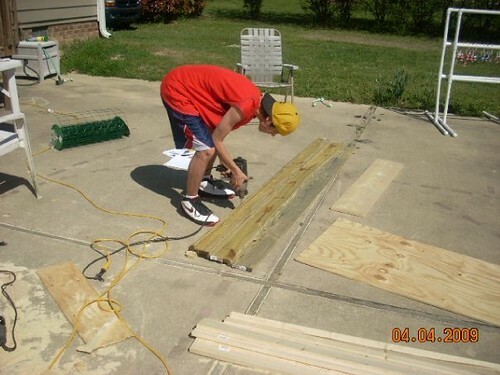 He has never built anything before in his life and did great! It looks even better than the photos online. He has stained/sealed it and it looks like a high end piece of furniture. I am sure he will have no trouble getting the price he wants for it...if he can let it go! Thanks again for the great customer support." 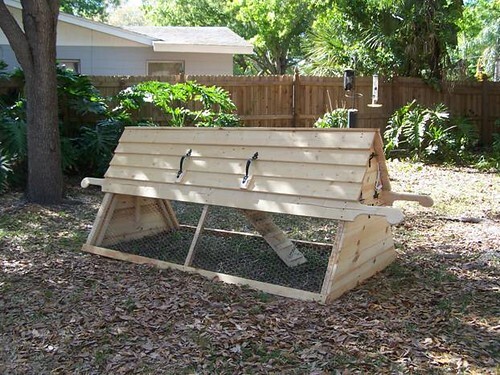 "I have the egg and coop doors done on one side. Unfortunately, I'm fighting board warping, so that's making it difficult. 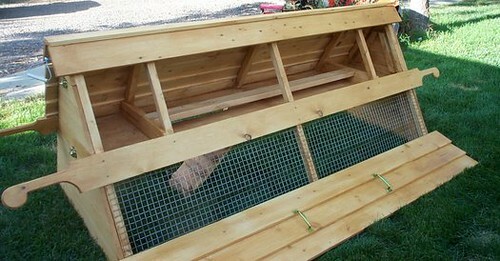 I think I'm going to build the other side by getting the wood close to the right size, but a little oversize. I'll then trim it down to the right size using my band saw. That will make cleaner matching edges." 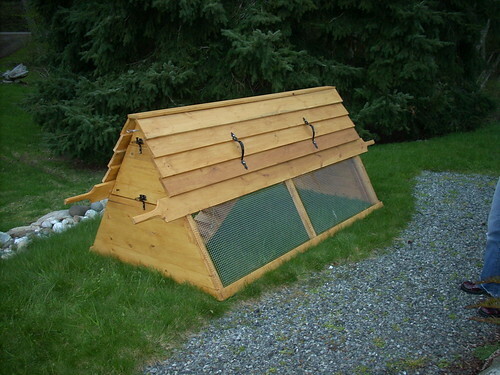 Deniece, your coop looks great! Nice choice of hardware clasps and handles. 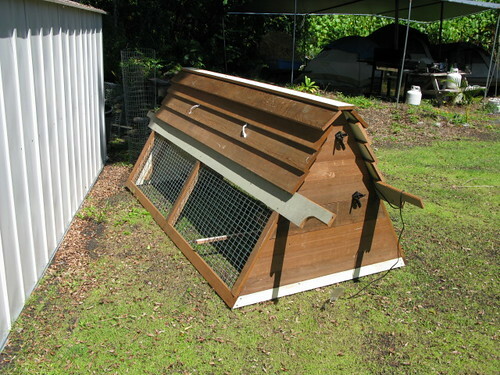 Dave's Original Catawba ConvertiCoop "Brougham Edition"
This is my second coop. 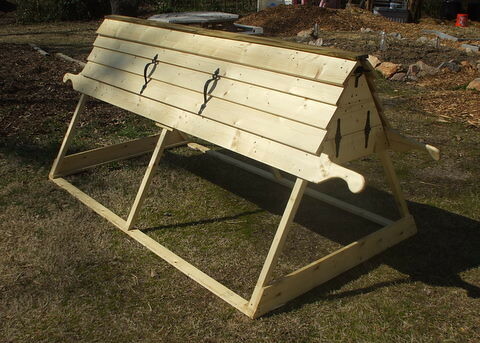 I used the prototype to work the kinks out and then built this one based solely upon the plans. We're featured on the evening news. 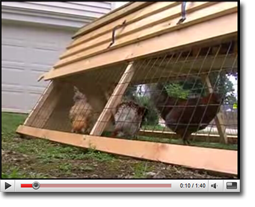 The piece below was originally aired by NBC-17 News on July 11th, 2008. 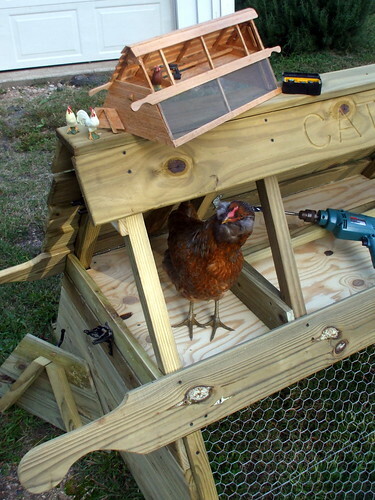 It's got a lot of great shots of the Brougham ConvertiCoop, and another chicken tractor that my wife asked my to build so that the kids could get in and play with the chickens. This is my original. 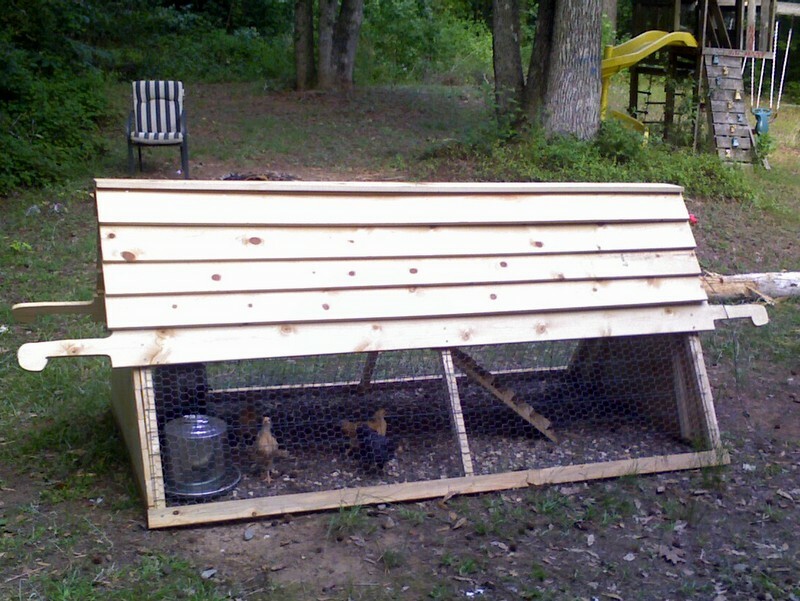 There are some things I don't like about it, such as horizontal boards placed along the ground that catch all kinds of dirt that the chickens kick around. I fixed these issues with the Brougham edition ConvertiCoop.